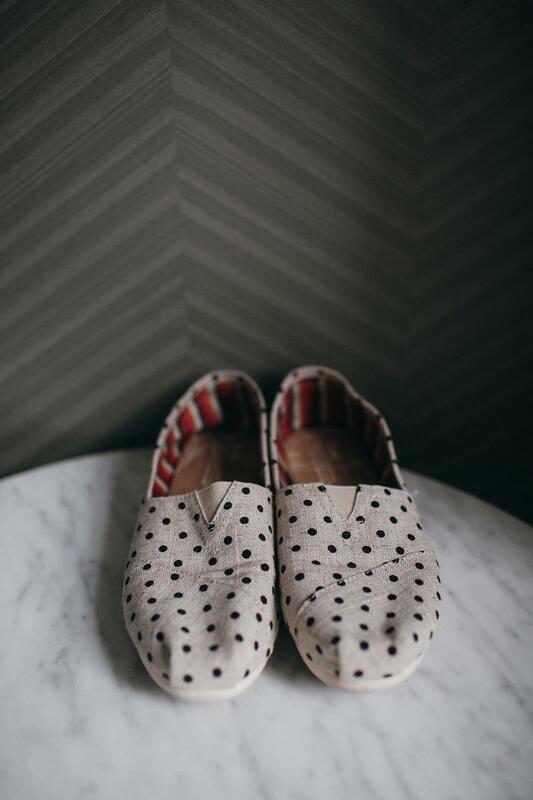 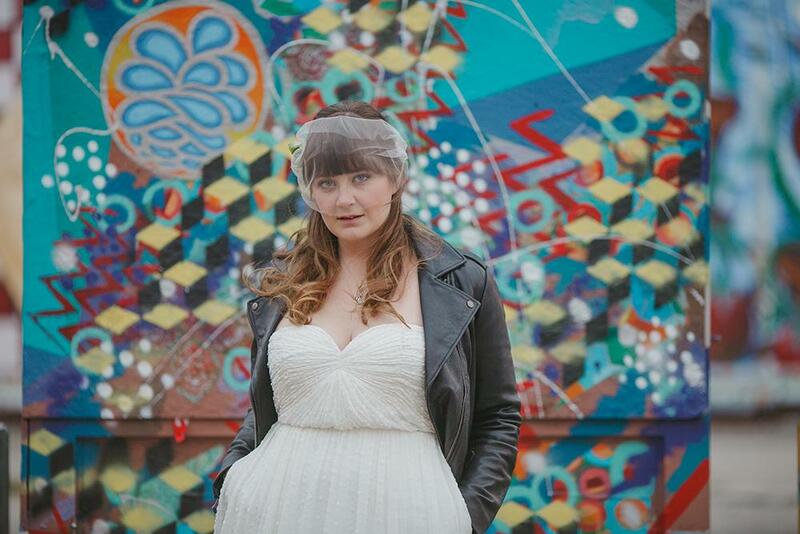 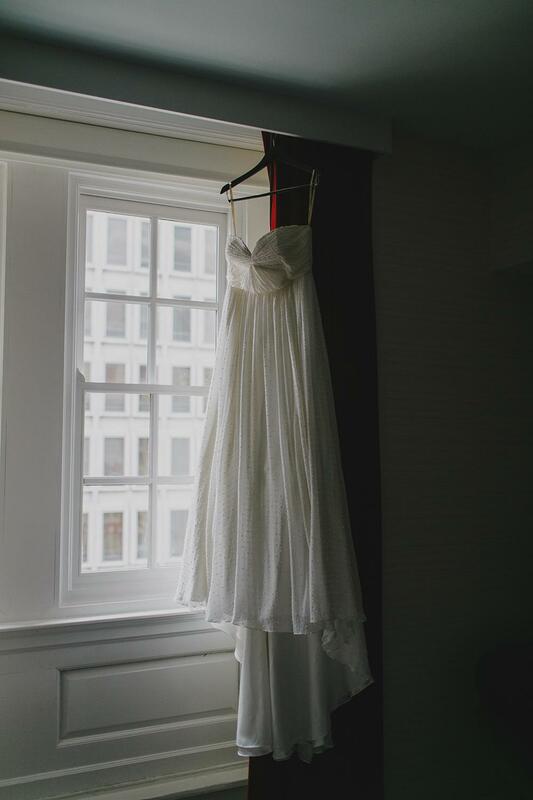 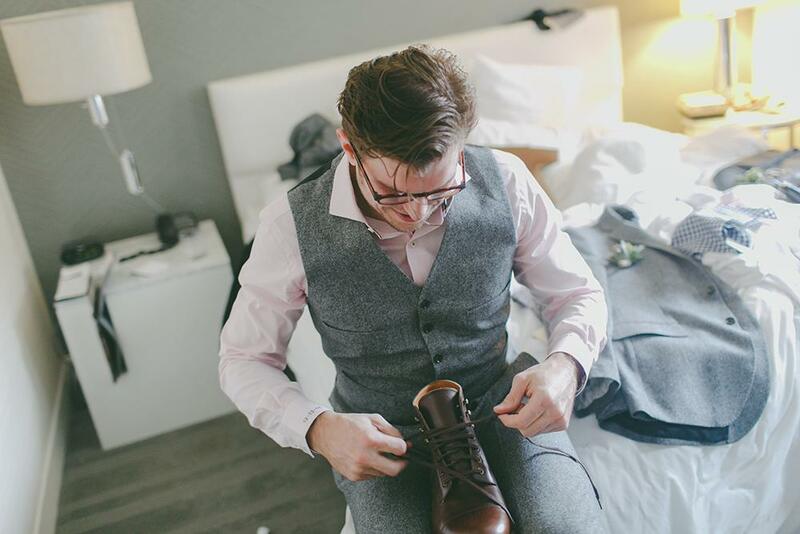 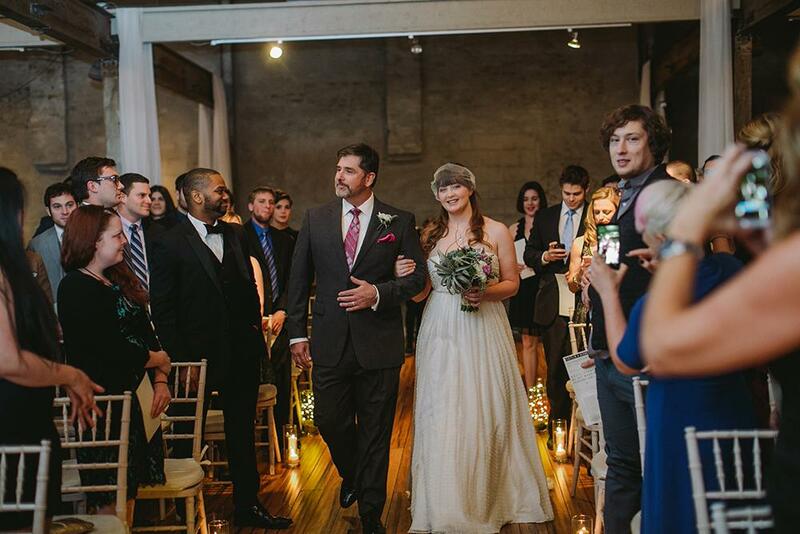 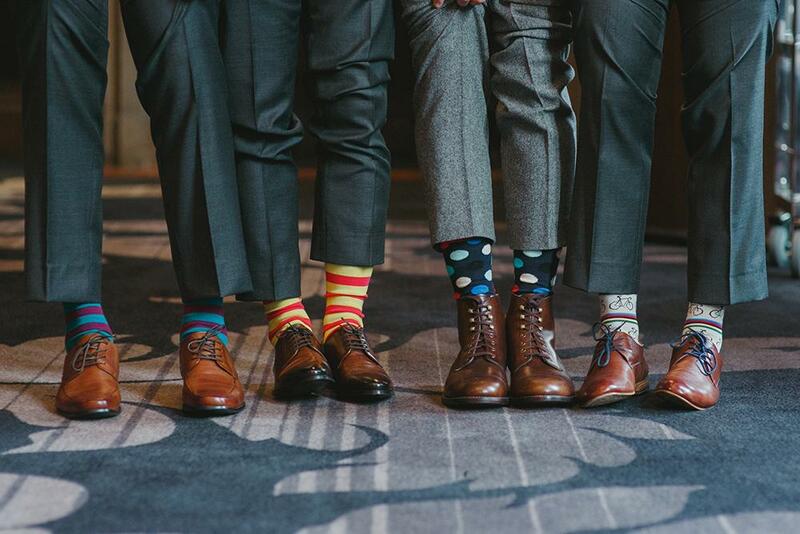 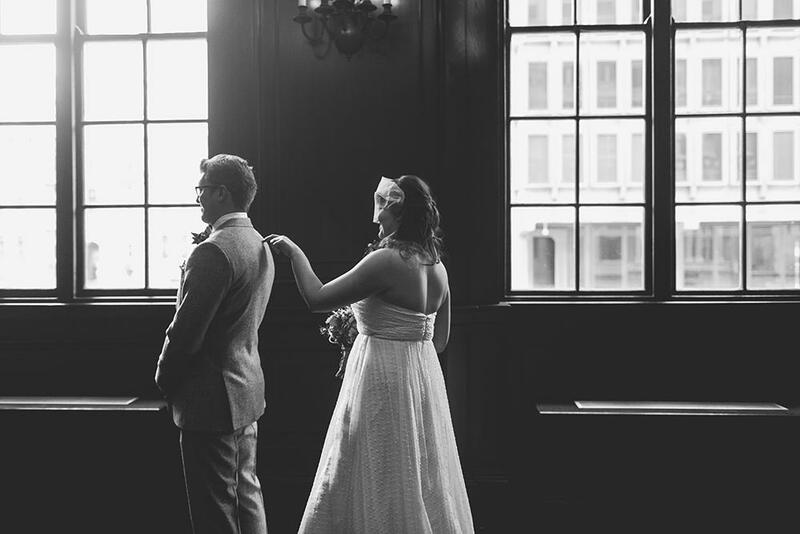 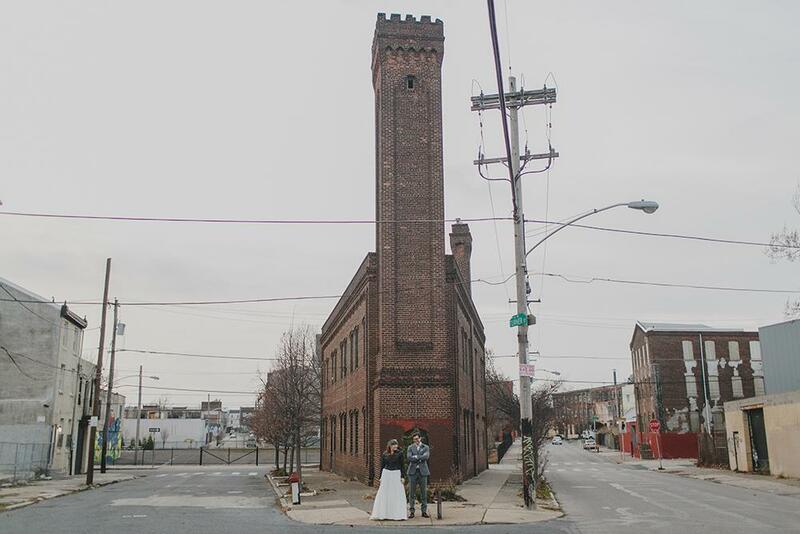 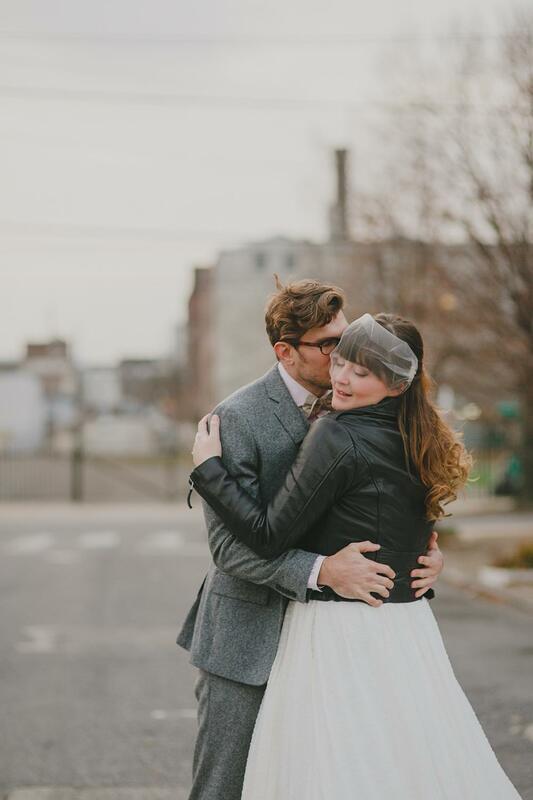 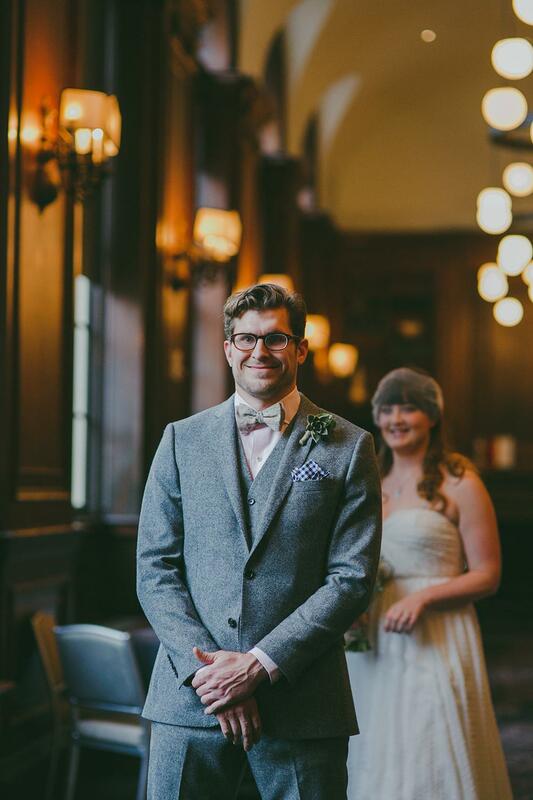 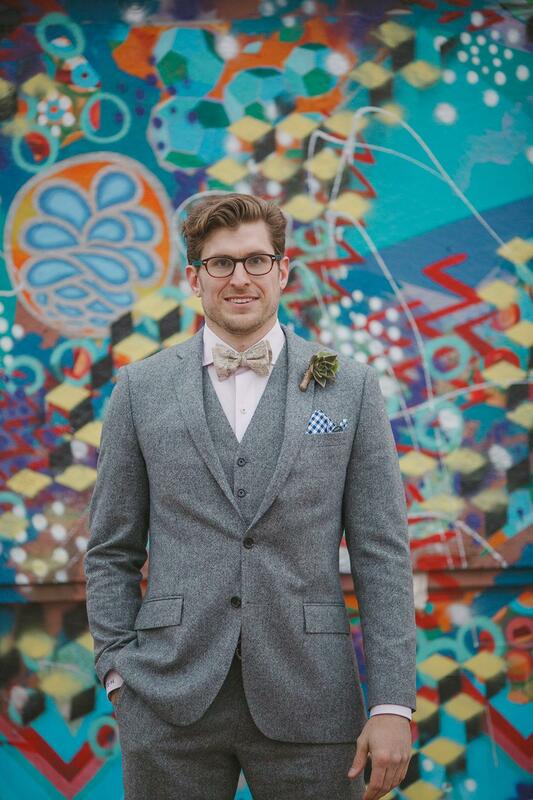 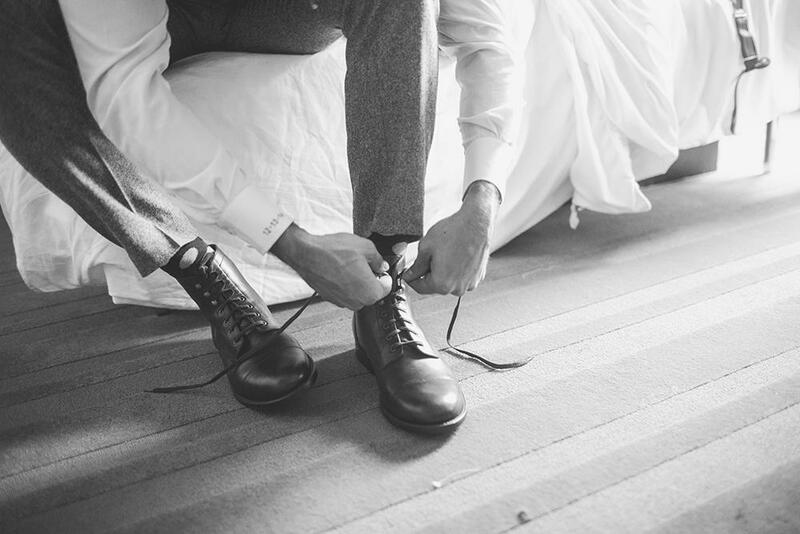 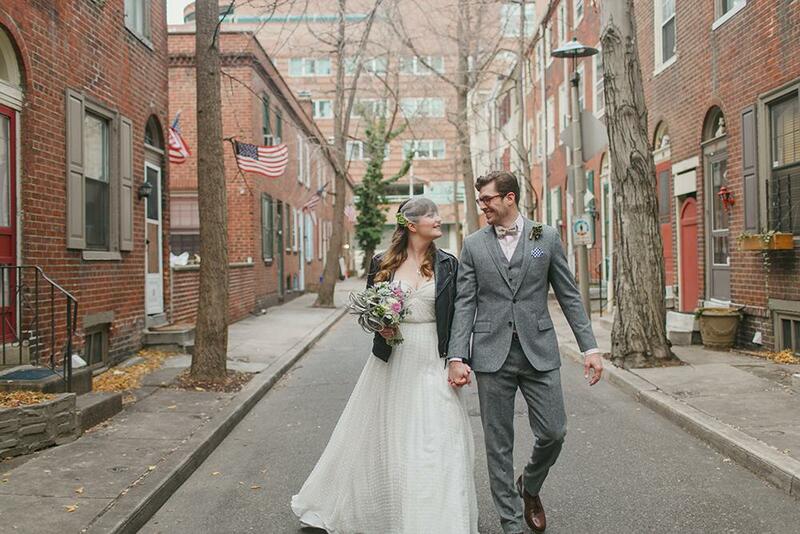 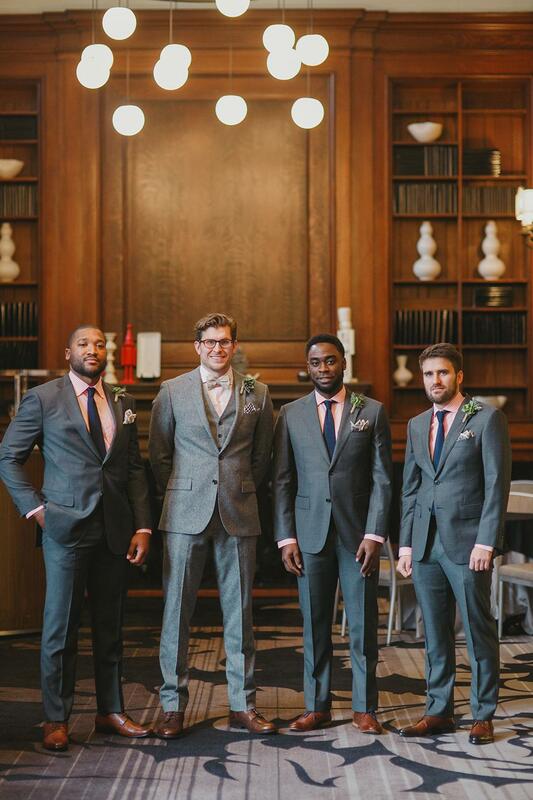 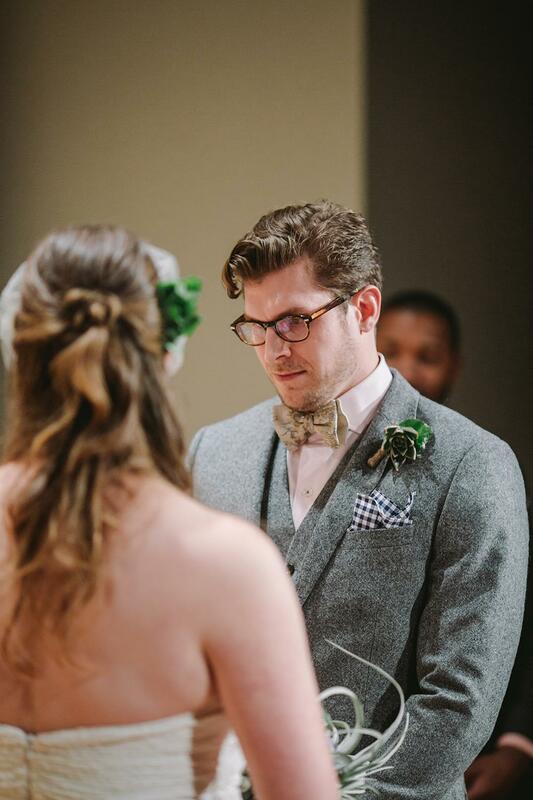 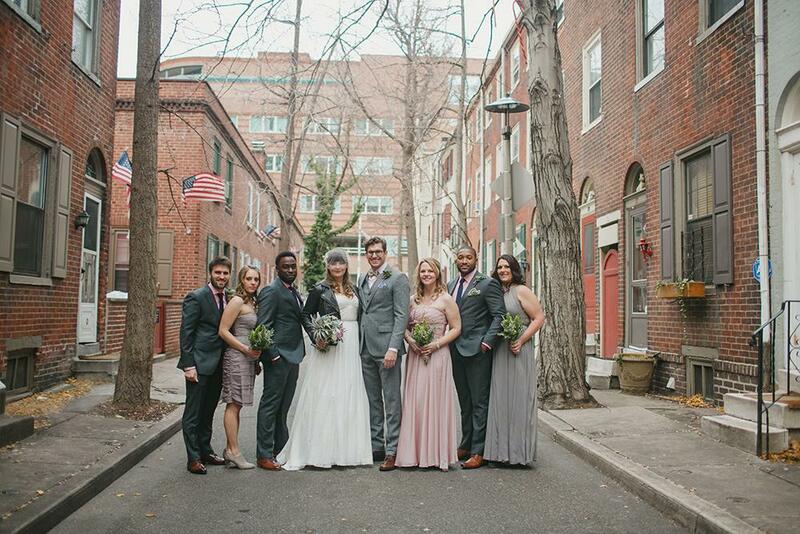 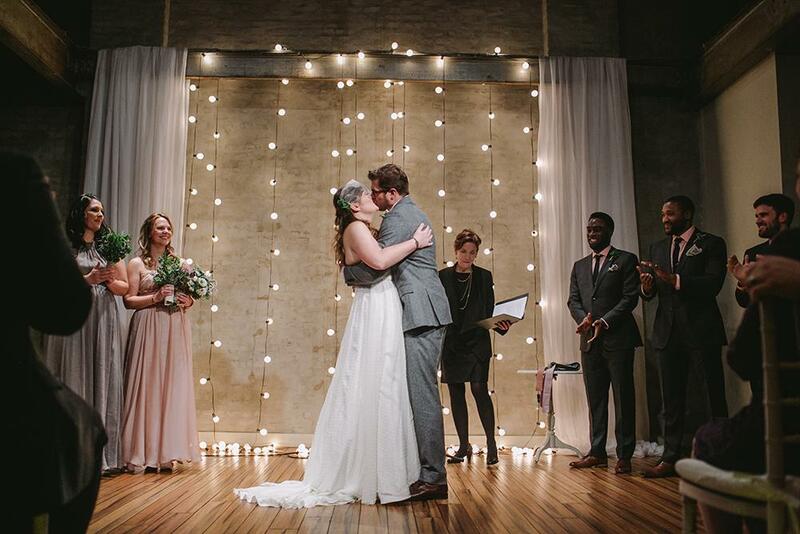 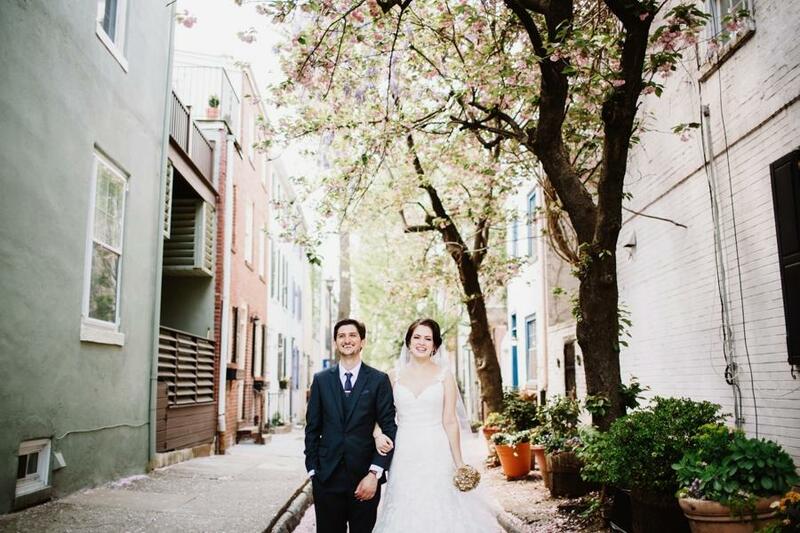 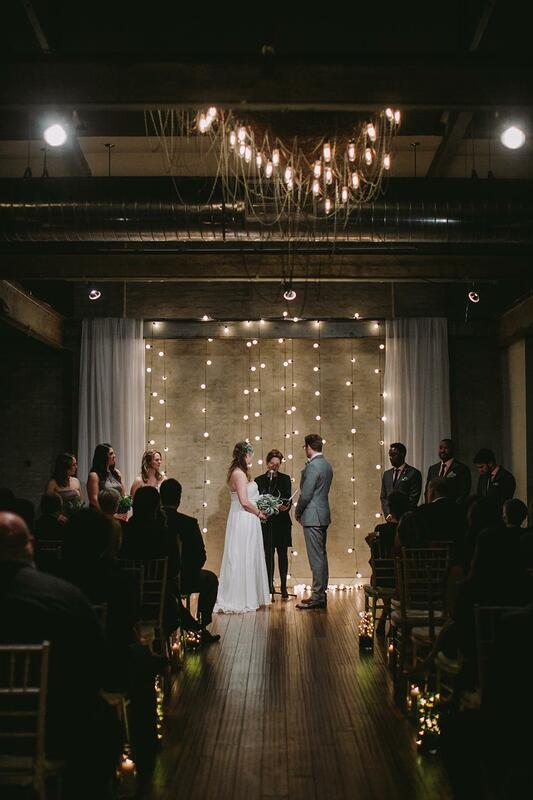 Caitlin and Derrec’s Philadelphia Wedding is overwhelmingly marvelous. 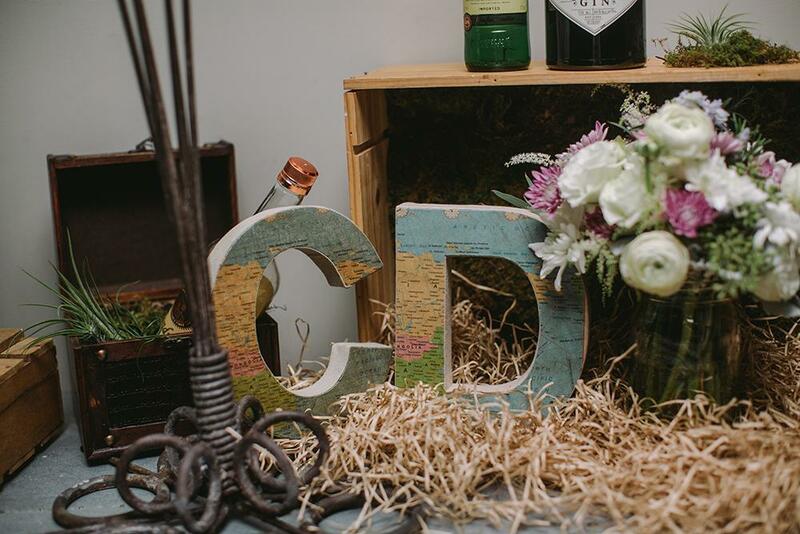 The two wanderer’s aimed at incorporating their love of adventure and travel into the heart of their wedding. 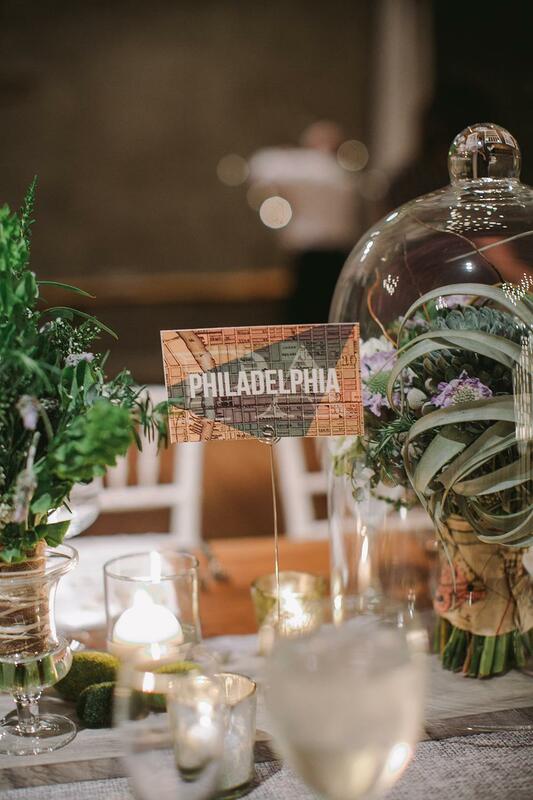 The theme thrived with the support of Papertini’s entwining and robust floral arrangements along with the urban Philadelphia settings. 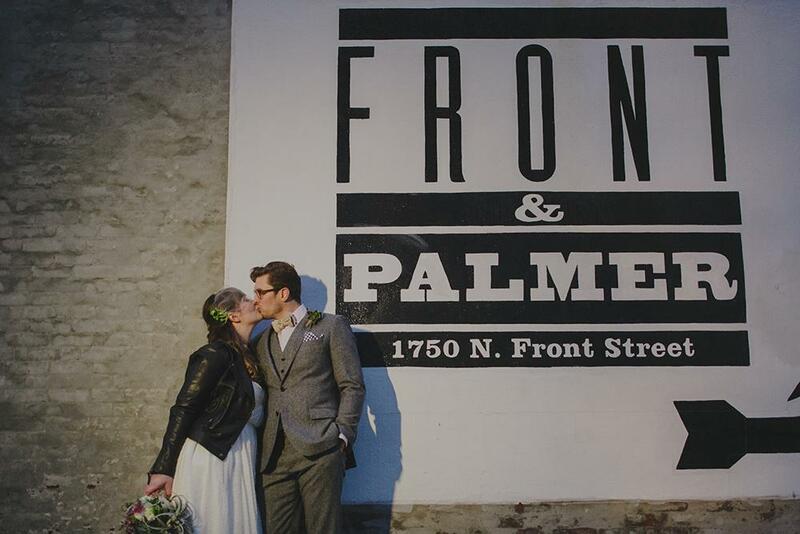 Front & Palmer was a pickle factory before it was a loft; its vintage appeal probably has something to do with its history. 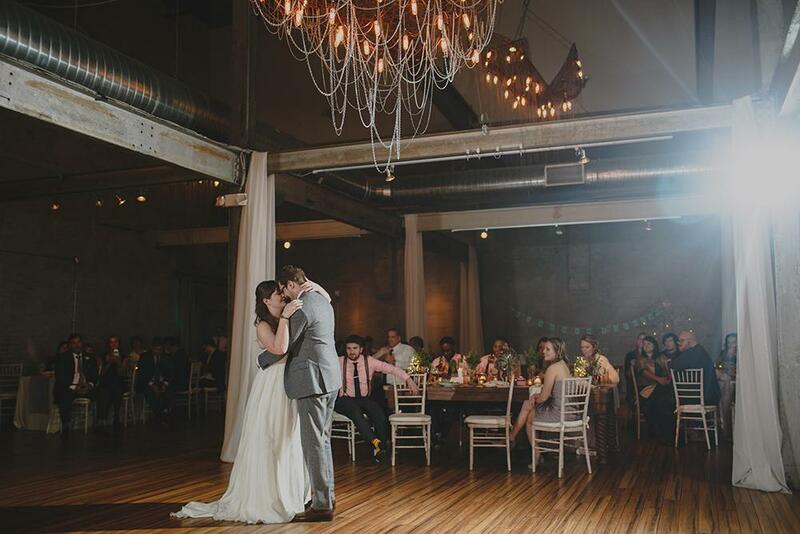 The setting is a great choice for a wedding reception, it really set up the vibe that gives this wedding its striking quality, but that could also just be Caitlin and Derrec. 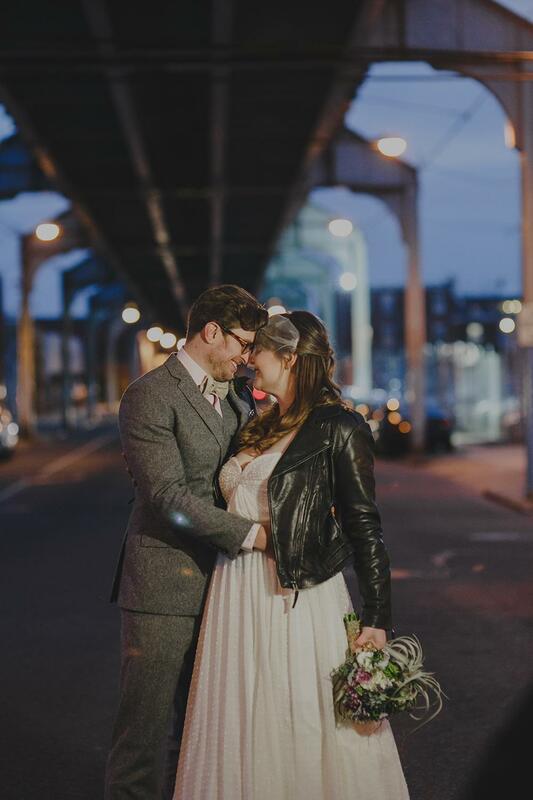 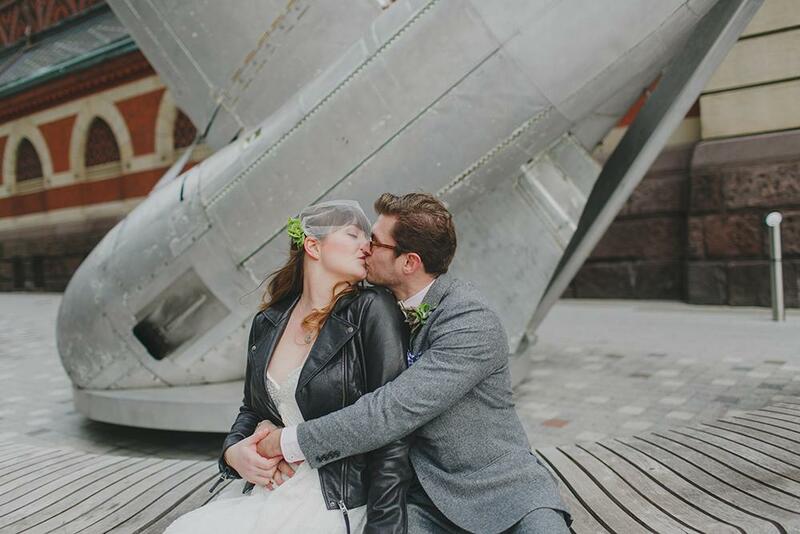 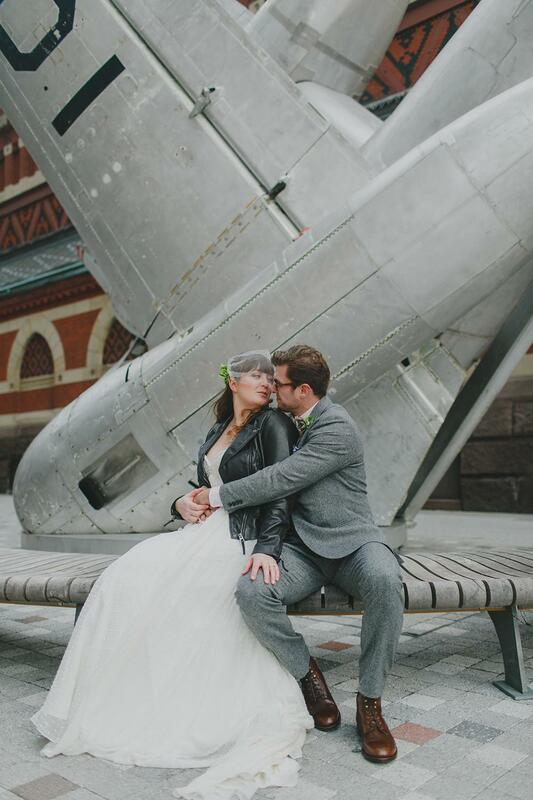 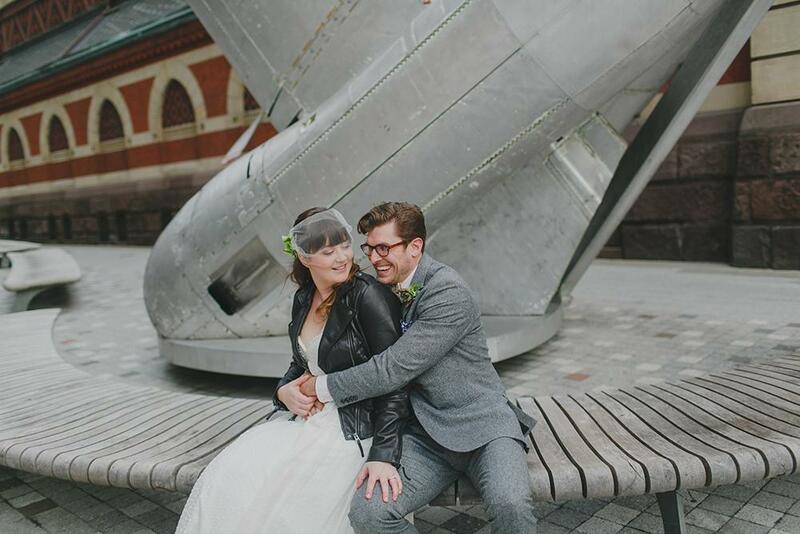 The bride gave new meaning to the words “rebel chic” in her leather jacket and standing next to her devilishly handsome groom, these two are a perfect match. 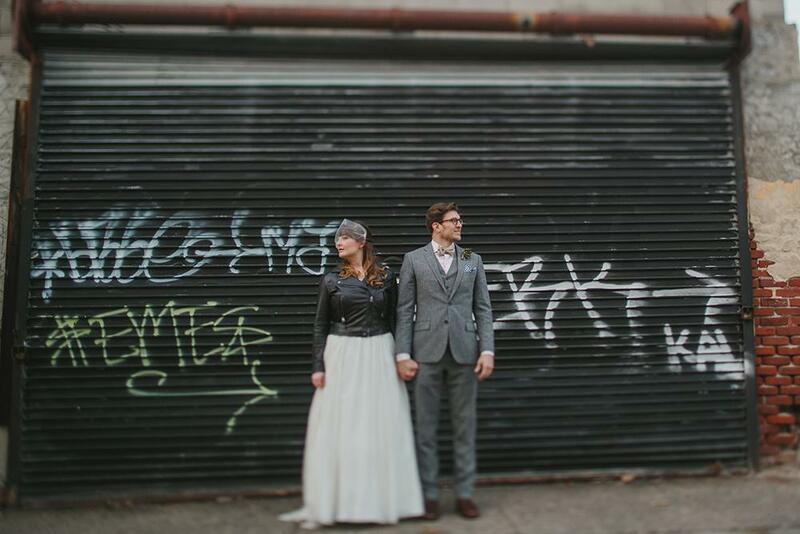 Let’s not forget to mention the Ivy & Aster “Sweet Pea” wedding dress from Lovely Bride, which by the way, has pockets! 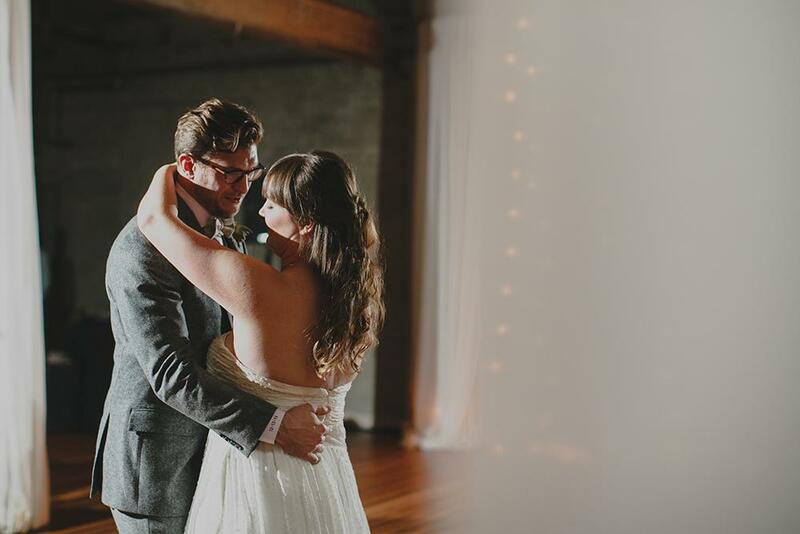 I am in awe of this couple, left speechless and enamored by the images and the story below. 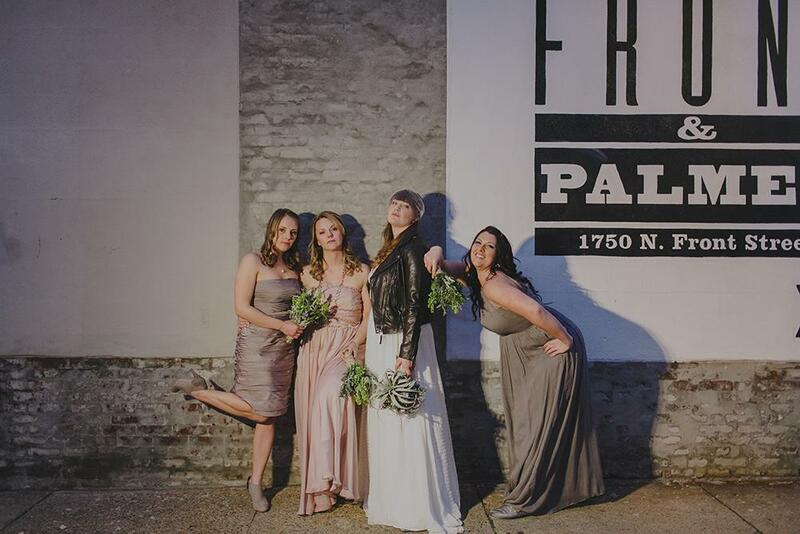 From the Beautiful Bride: When we met in senior year of high school, it was 2002, the second Harry Potter movie was just released, the first generation of the iPod was out and the number one song in the country was “Lose Yourself” by Eminem. 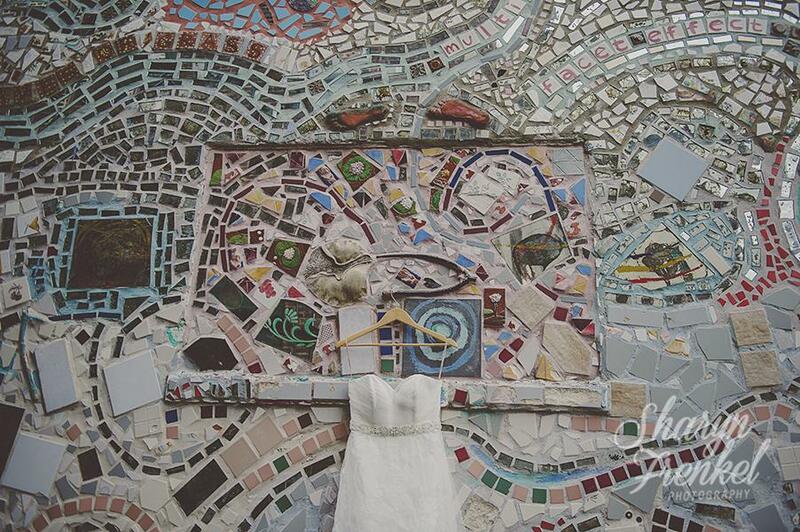 So clearly 2002 was a bang up year! 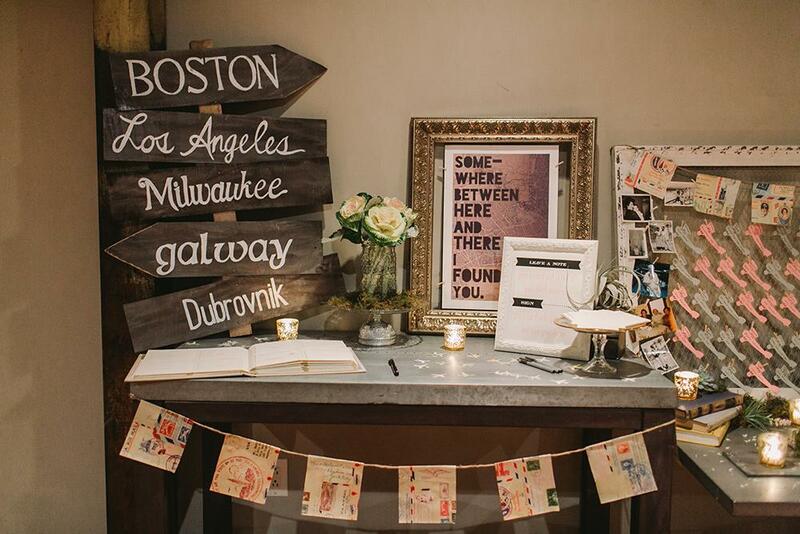 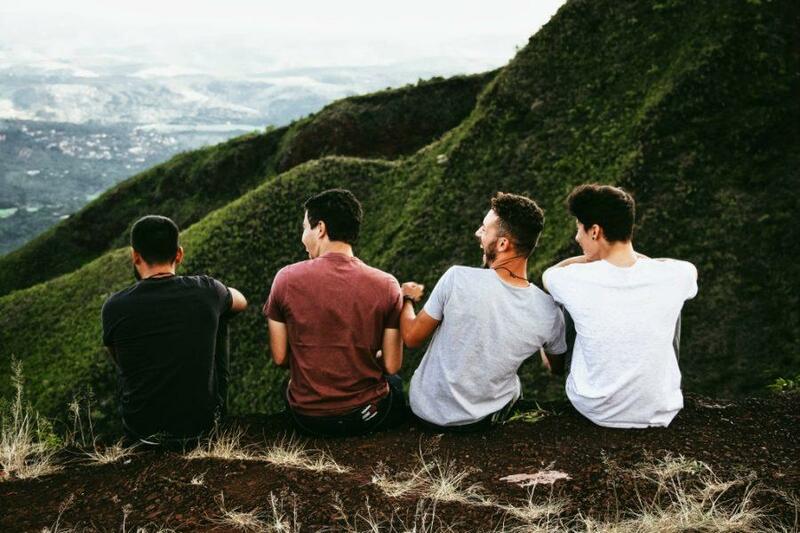 One of the first things we had in common was our shared desire to travel and see the world. 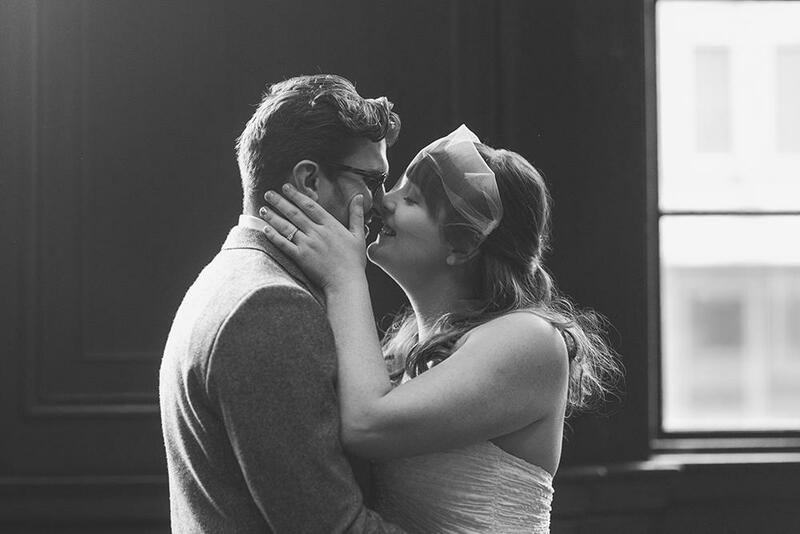 And in the twelve years we were together before our wedding, we lived in and visited many places from New Orleans to Copenhagen, making time for as many adventures as possible, relishing in the planning process, dreaming about where in the world we could go next. 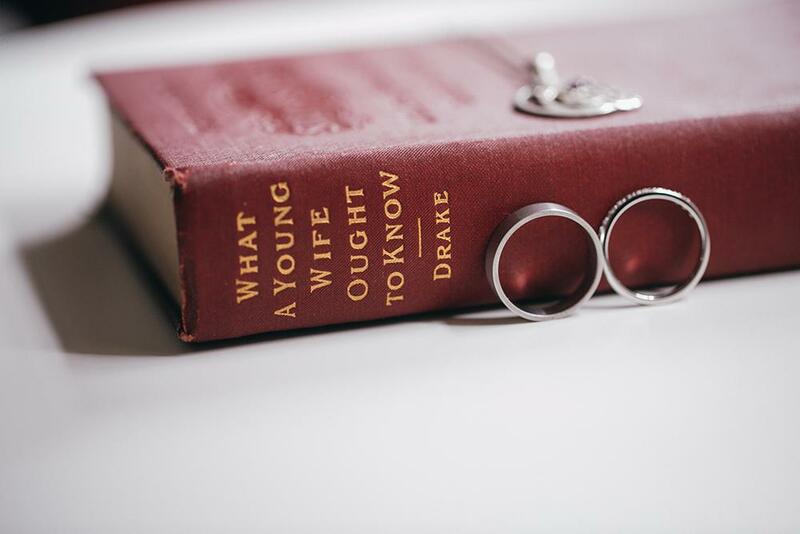 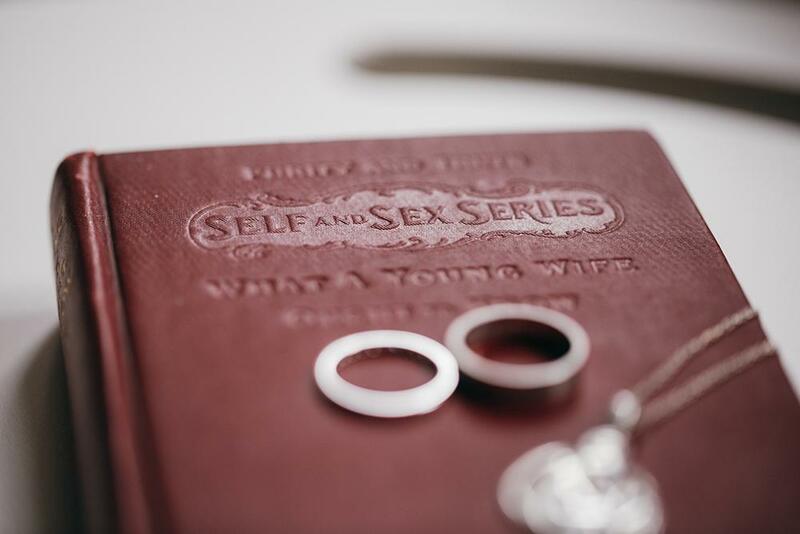 Thus it made perfect sense to incorporate this very important aspect of our lives into our wedding as authentically and of course, with as much fun as possible. 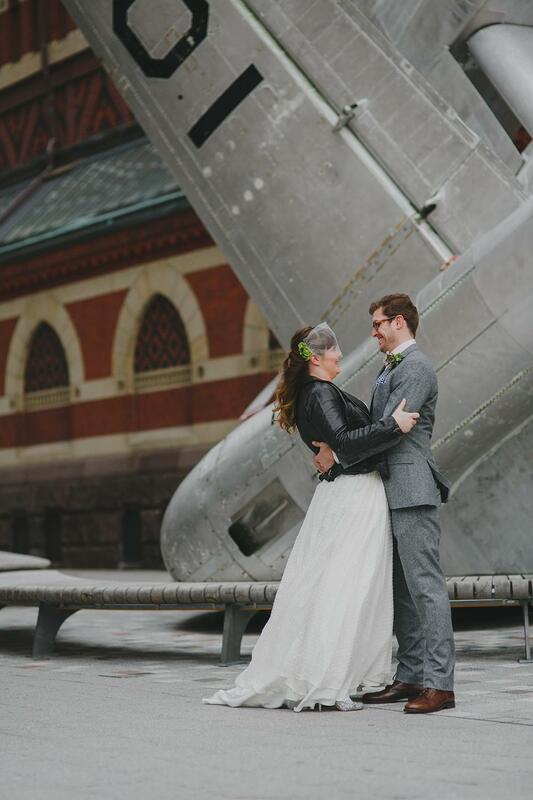 We had such a wonderful time throughout the entire planning process, and made sure to always check in with each other and remind ourselves that this was another adventure that we were going on together and to always remember to have fun. 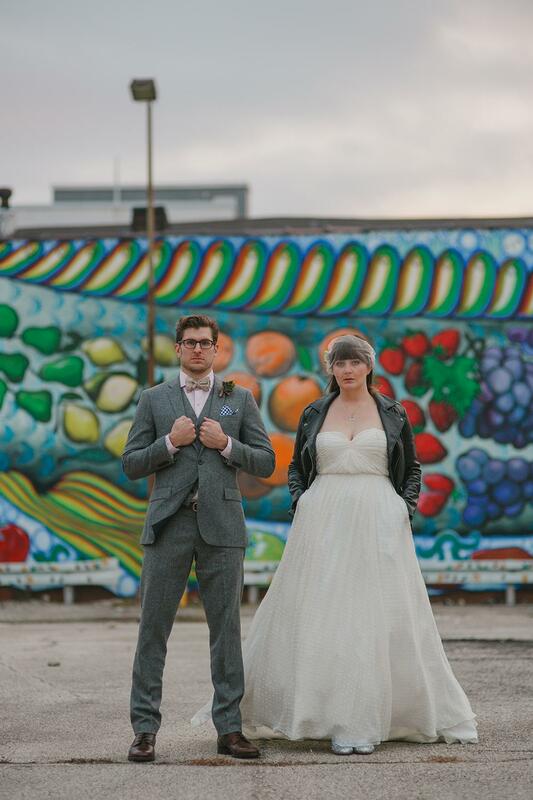 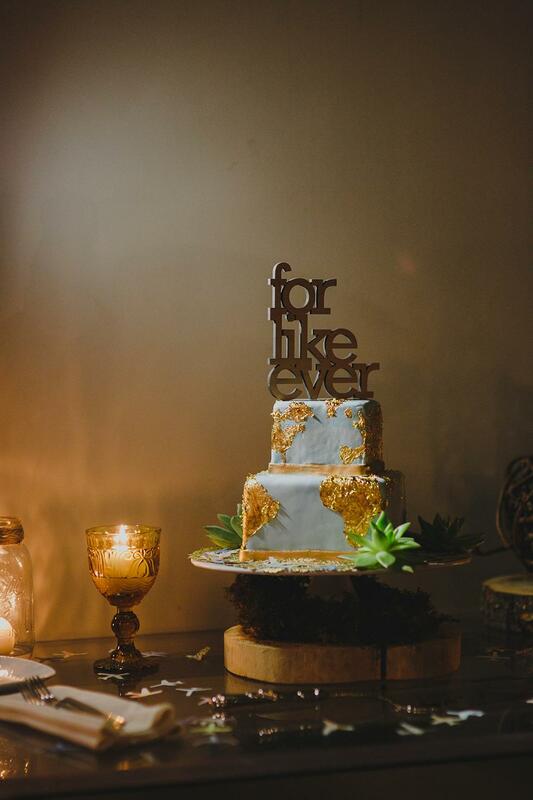 From the beginning it was essential that we have our wedding somewhere that allowed us to incorporate our own unique style and vision, where our travel theme would not clash with the setting. 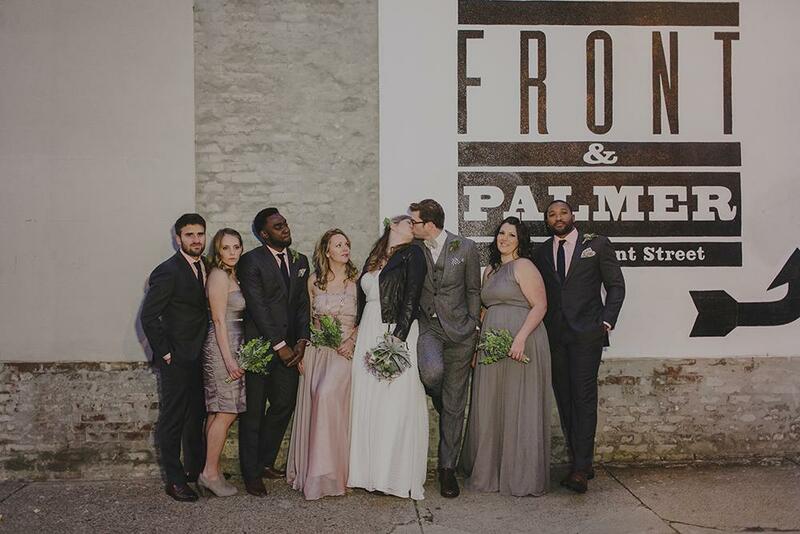 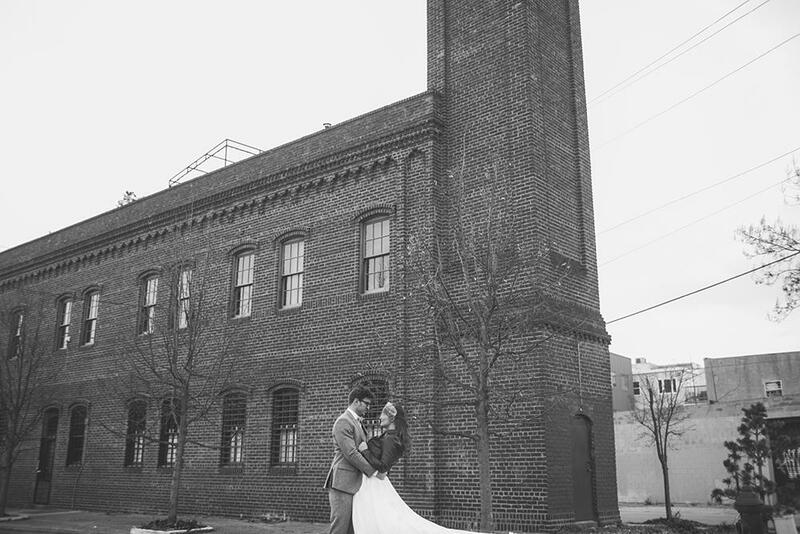 Front & Palmer (a recently renovated loft space that was a 19th century pickle barrel factory) was the absolute perfect venue; it provided us with the essential “blank slate” that we needed and also appealed to our love of that perfect combination of vintage and modern. 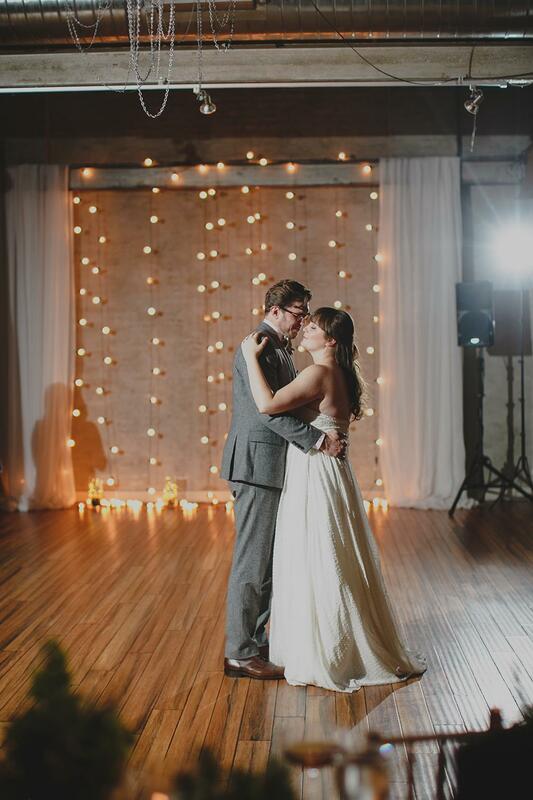 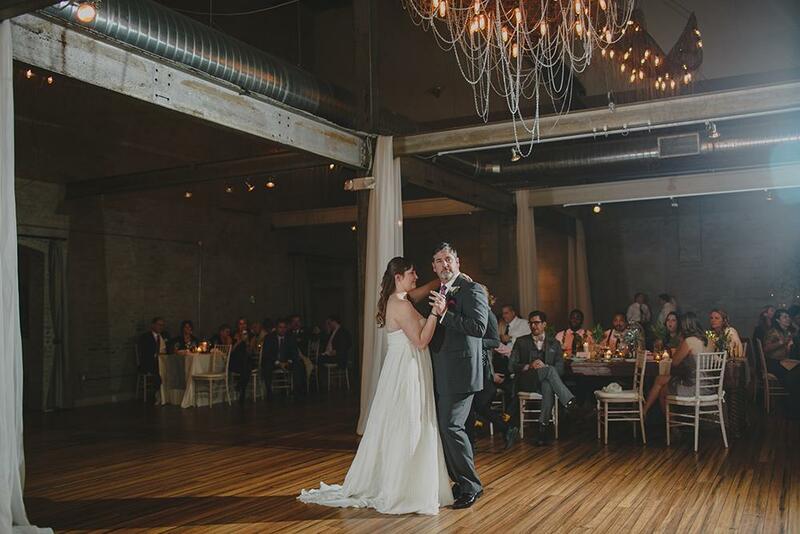 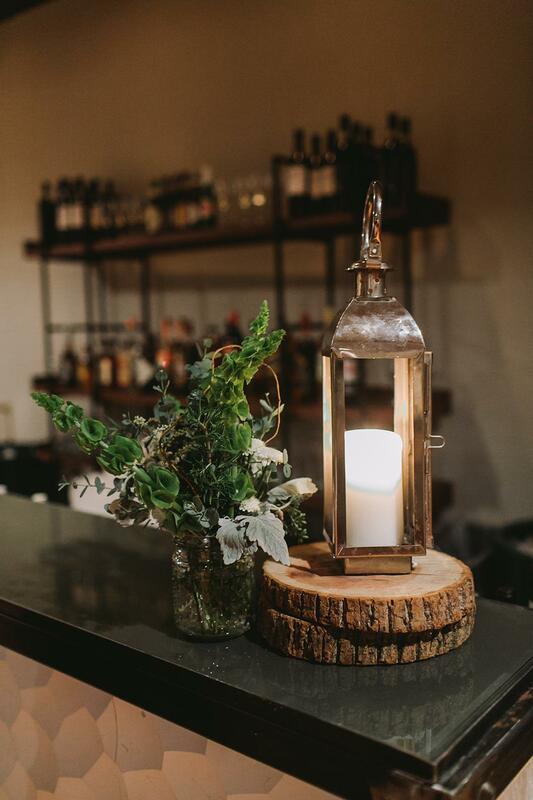 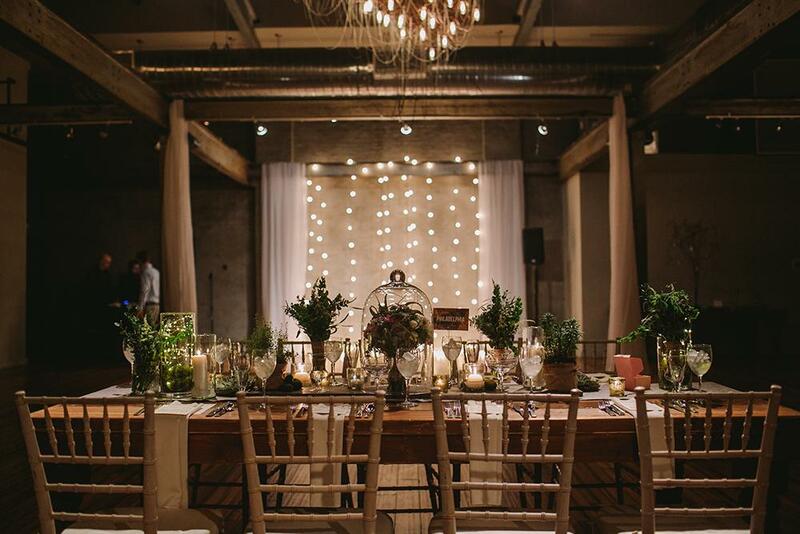 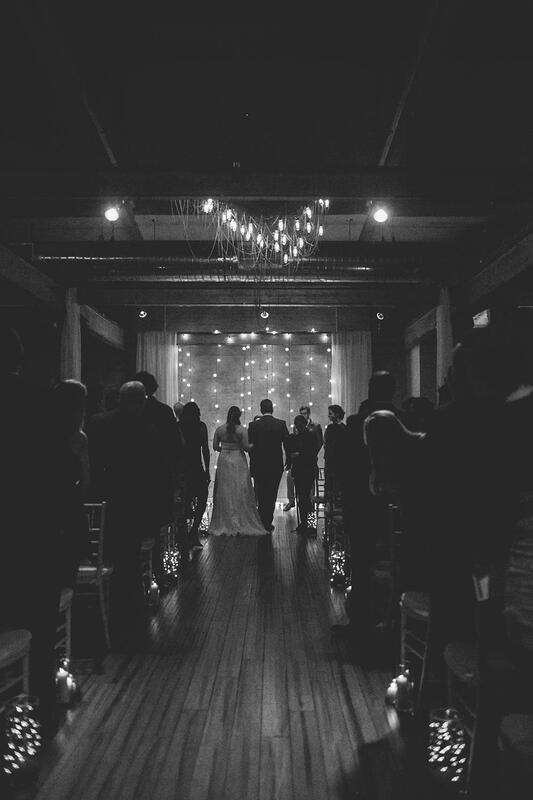 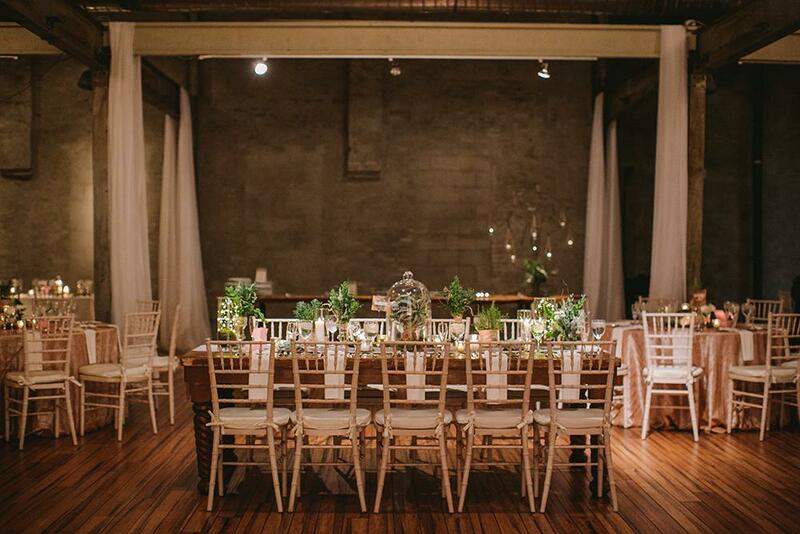 The exposed steel beams and brick, the gorgeous wooden floors and the warm glow that emanated from the incredible chandeliers set the perfect simple, industrial, yet ethereal atmosphere. 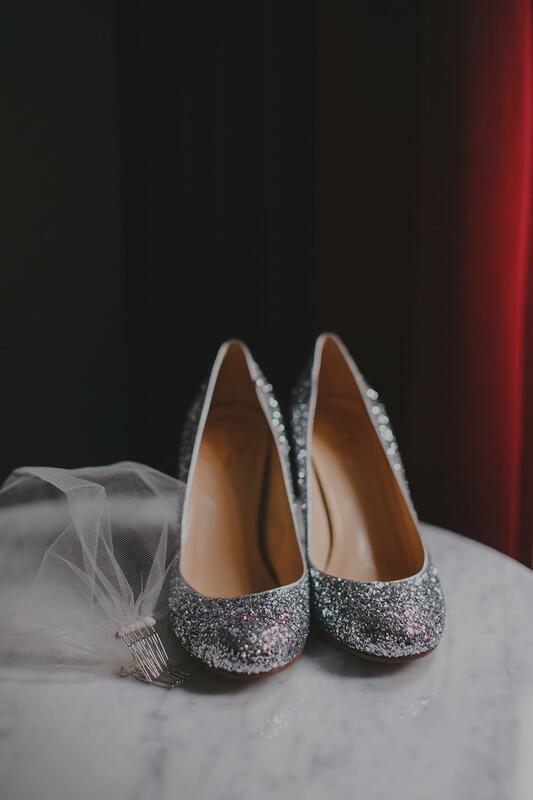 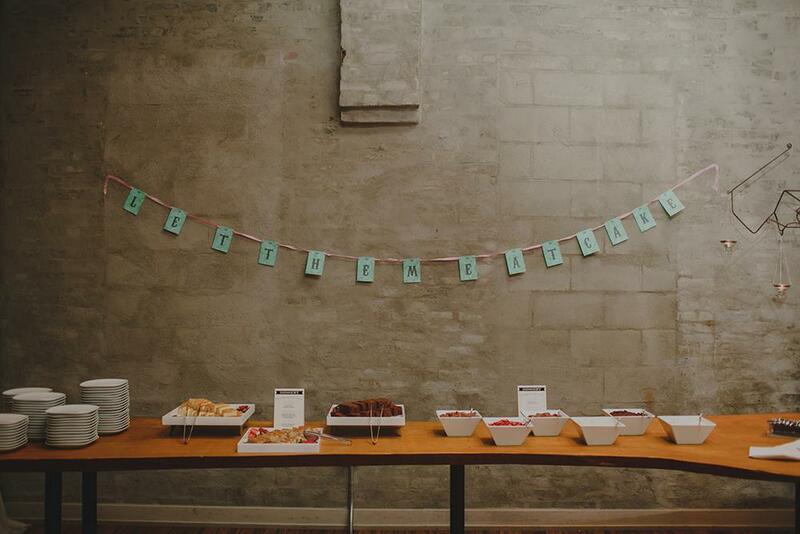 Once we found the venue we were very lucky to find our photographers, Carina and Amanda of Love Me Do Photography. 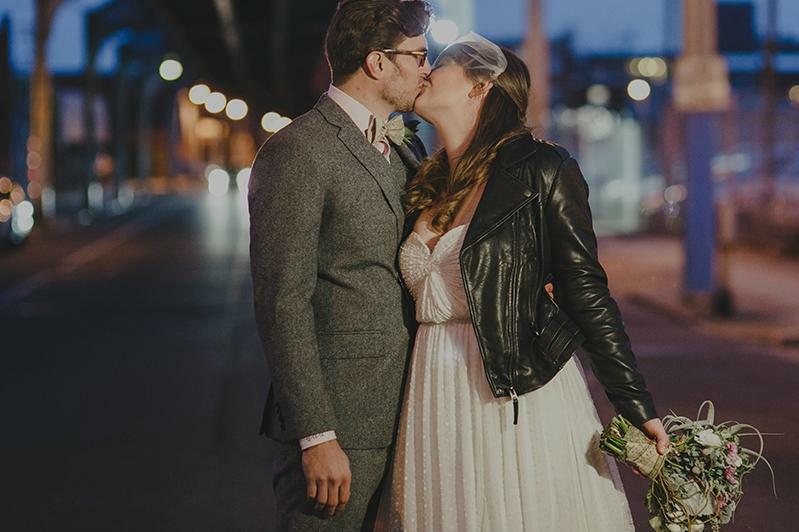 We knew right away after meeting them, that they would be able to capture that airy romantic feeling we wanted in their ability to seize authentic moments through their artistry and non- traditional approach. 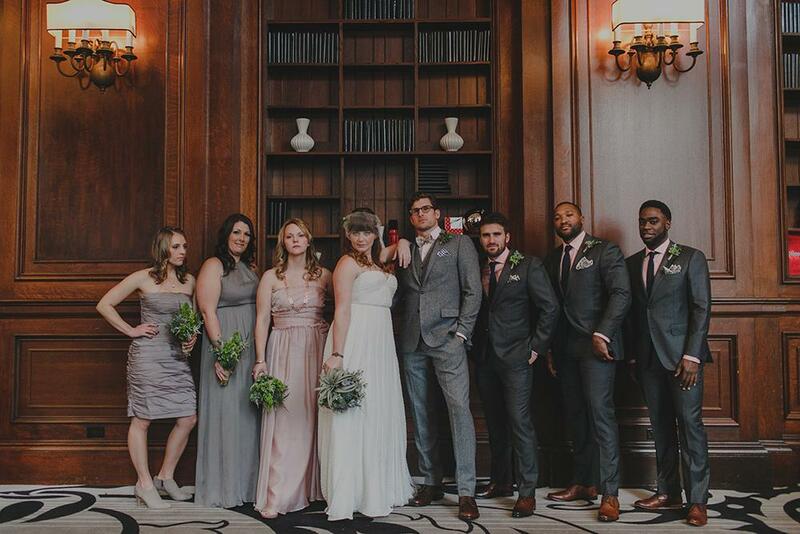 Their eye for lighting, mixing backgrounds, and palettes worked perfectly with our muted pink and grey color scheme. 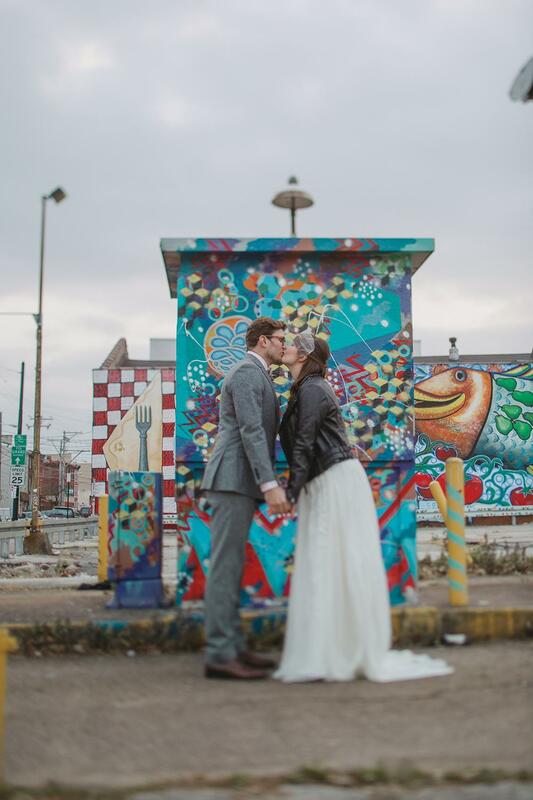 It also allowed us to really play up the natural setting of Philadelphia, with its great mix of industrial, colonial, modern and of course, the fun vibrant street murals. 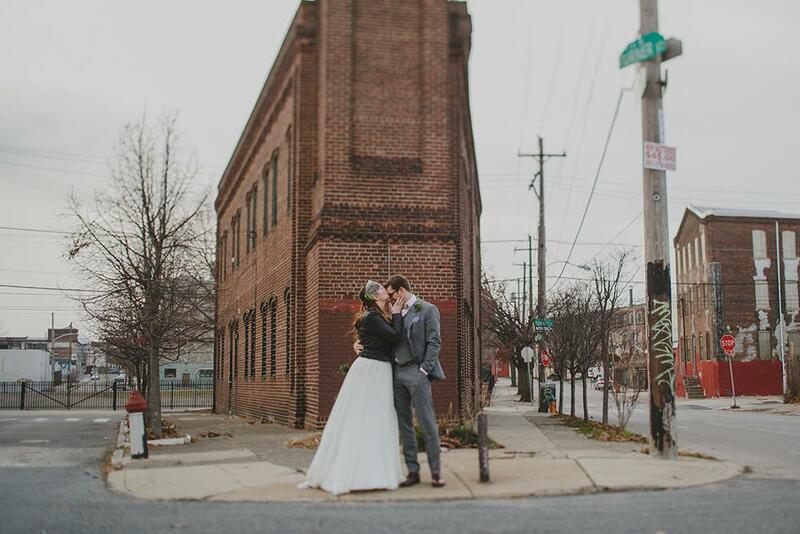 We worked with Love Me Do for our entire wedding suite; photography, videography and photobooth at the wedding as well as a Trash the Dress session a month after the wedding (and I even did a boudoir session prior to the wedding as gift for Derrec!). 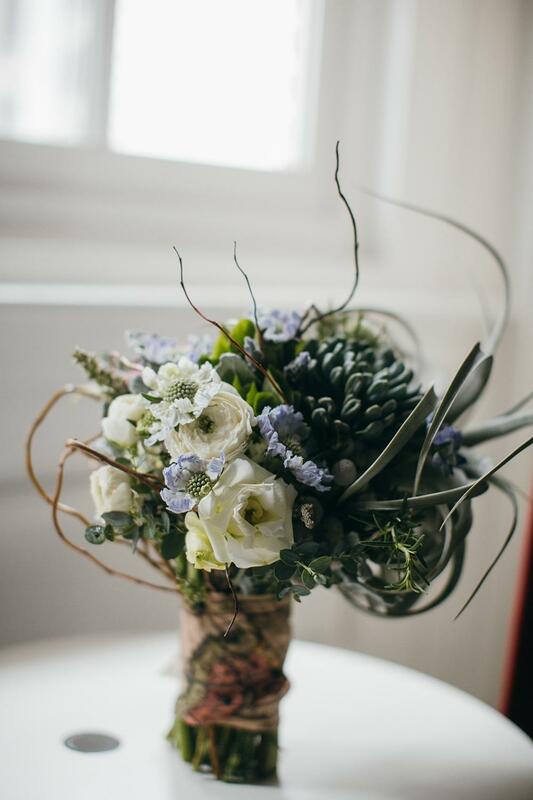 As for our florist, working with Tanti of Papertini was in a word: AMAZING! 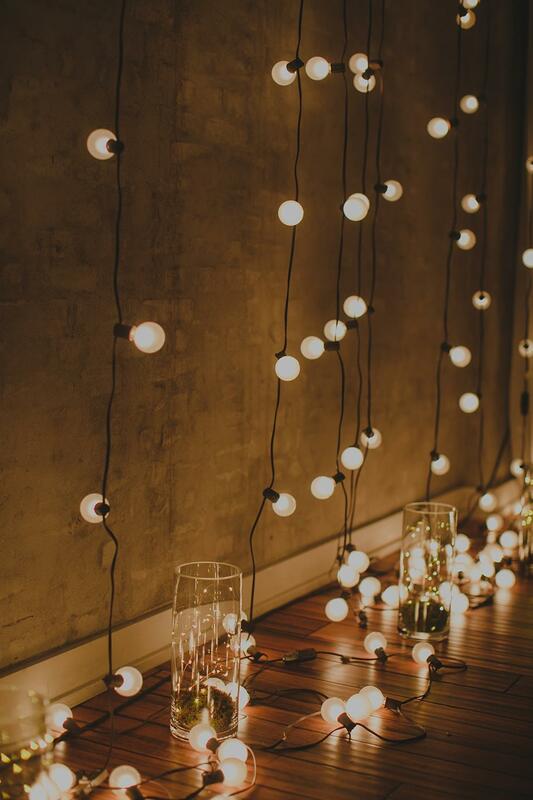 From the minute we met, we knew we had nothing left to worry about. 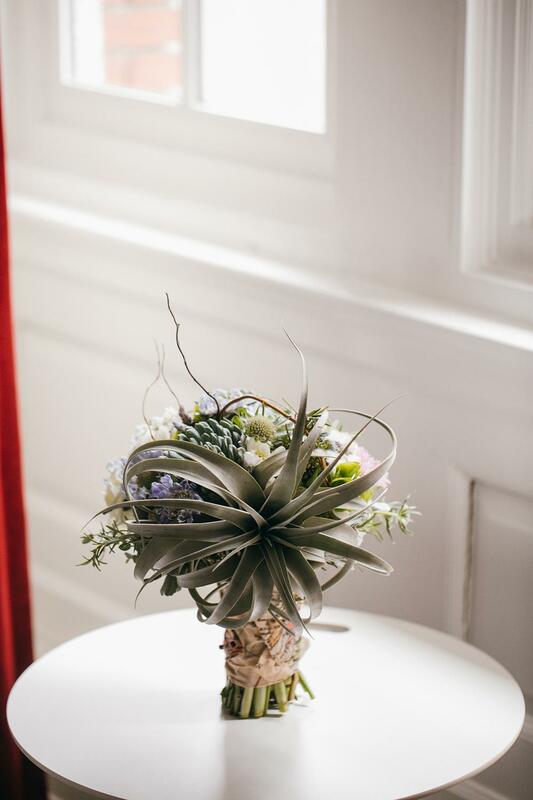 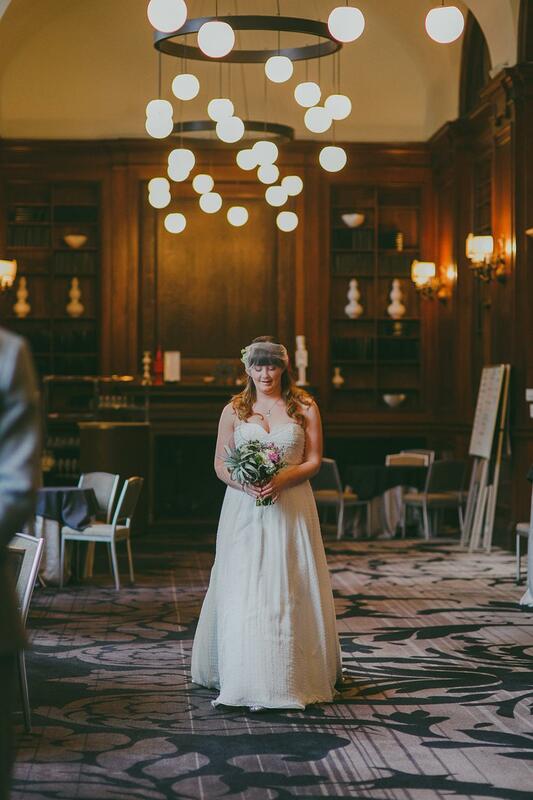 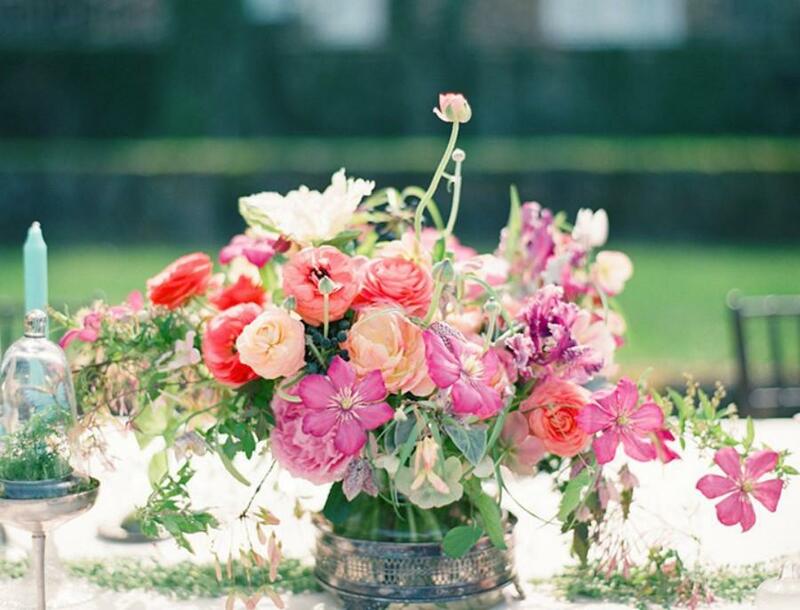 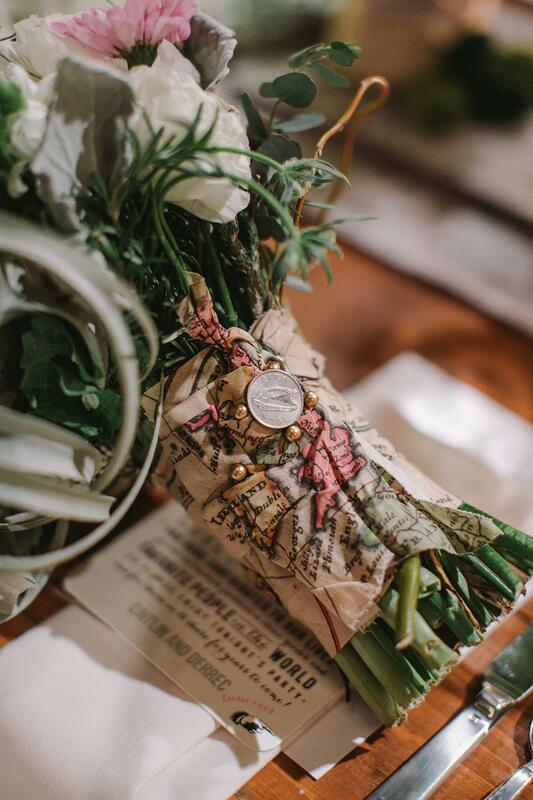 She understood completely my ambivalence towards flowers, and was able to fully envision a gorgeous and dreamy look from my bouquet to the table décor to the lighting and had really creative ideas for a simple yet unique way to play up our travel theme. 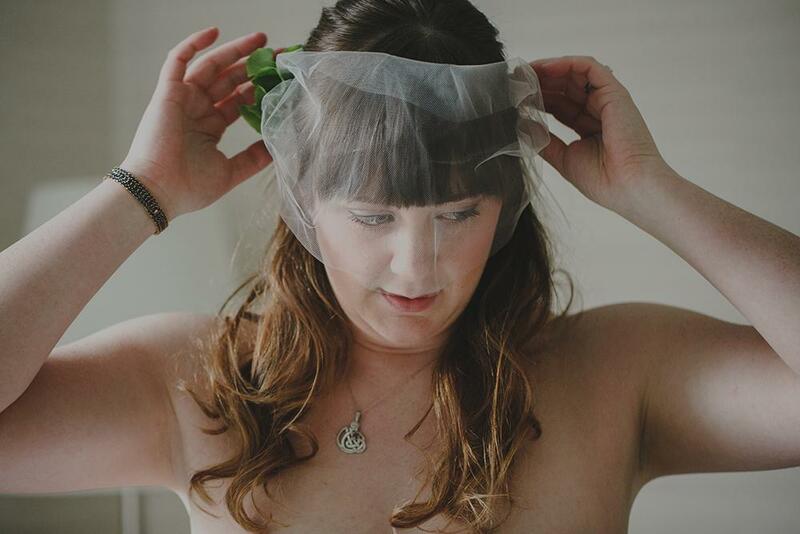 Tanti really took her time with us; it was clear that her customers are very important to her and she genuinely wanted to make us happy and at ease with the whole process. 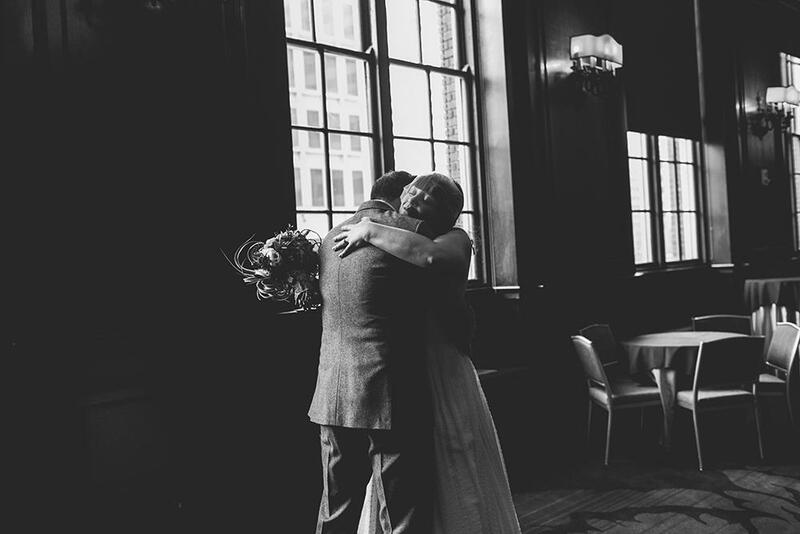 She also had a quick thorough mind for how to work within our budget, and was always enthusiastic, warm and incredibly fun. 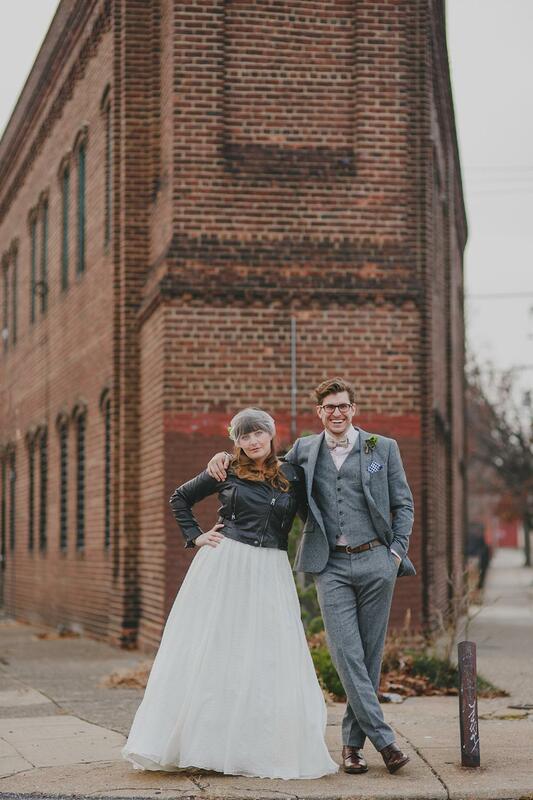 She brought the entire aesthetic to life. 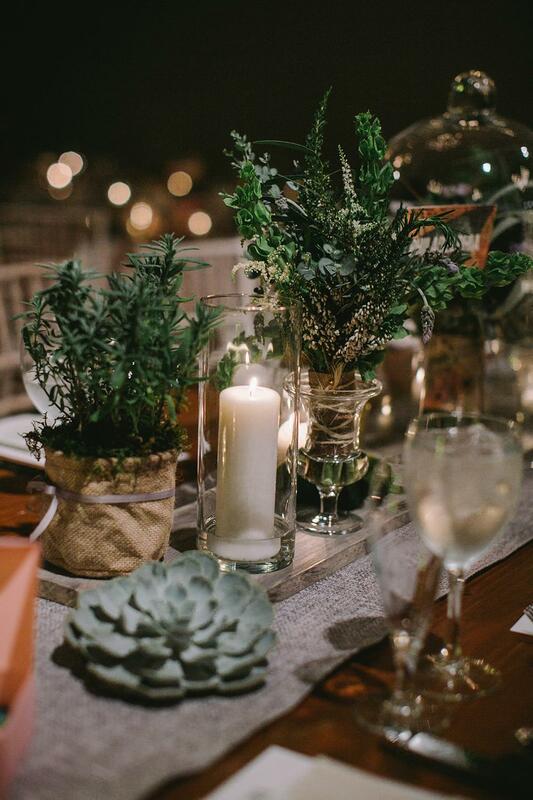 Beyond flowers each individual succulent and herb set perfectly with vintage globes, luggage and warm candlelight along with large cloches filled with moss exceeded our expectations. 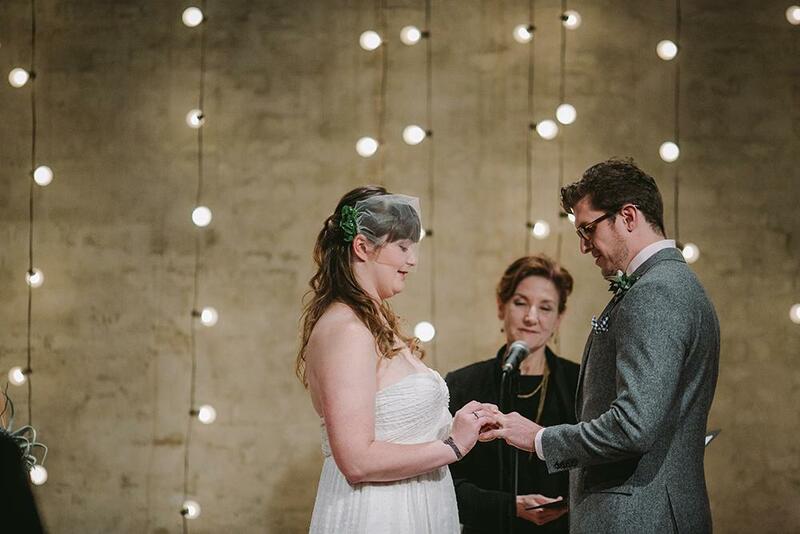 The design and execution in creating the altar backdrop was gorgeous: she went above and beyond the floral work with an incredibly romantic light installation that was exactly as we had envisioned. 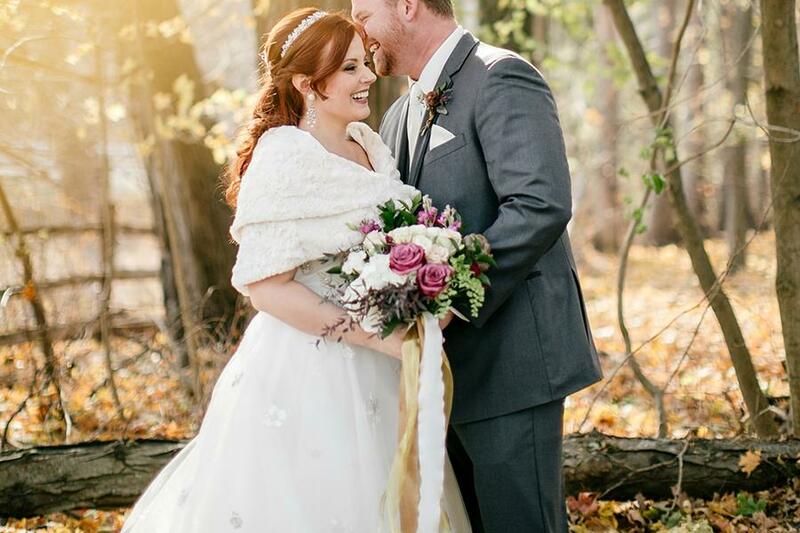 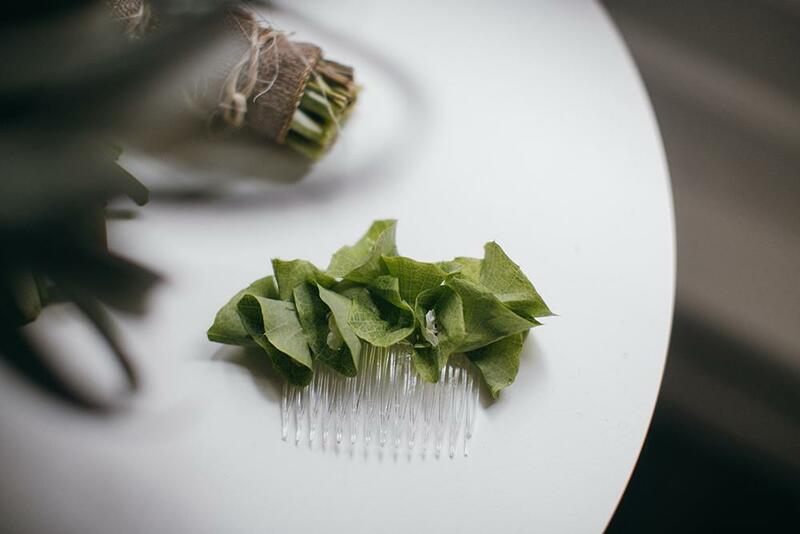 Knowing that I wanted to incorporate my Irish heritage into my hairdo Tanti gifted me with a beautiful hairclip made out of Belles of Ireland flowers that was such a unique touch, I received so many compliments on it. 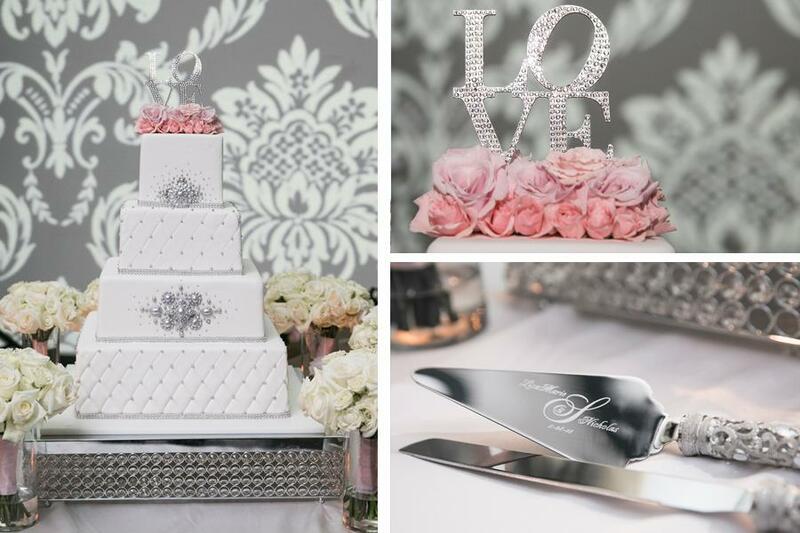 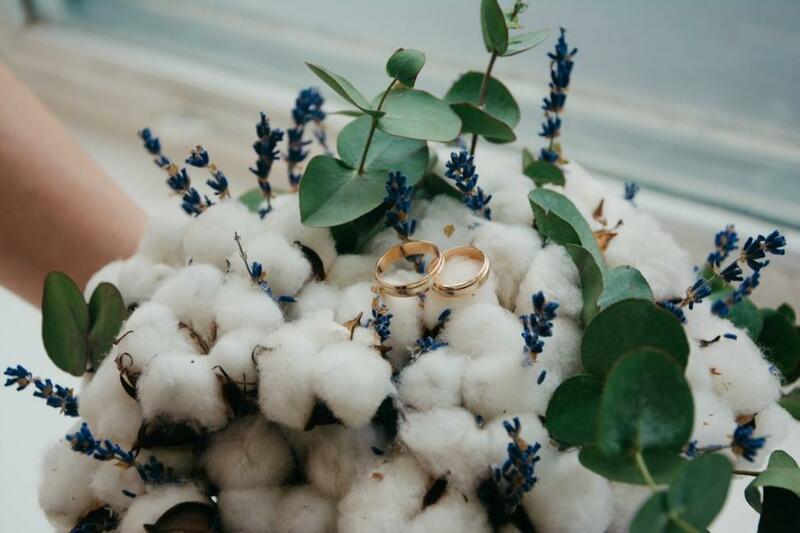 We had such a great experience working with Tanti and are so grateful for how beautiful everything turned out; from all the bouquets, to the special details that made each aspect so personable and memorable. 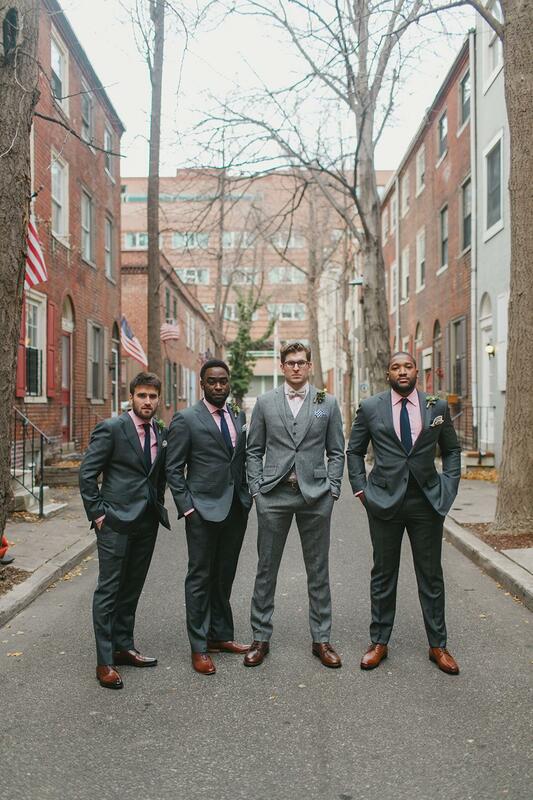 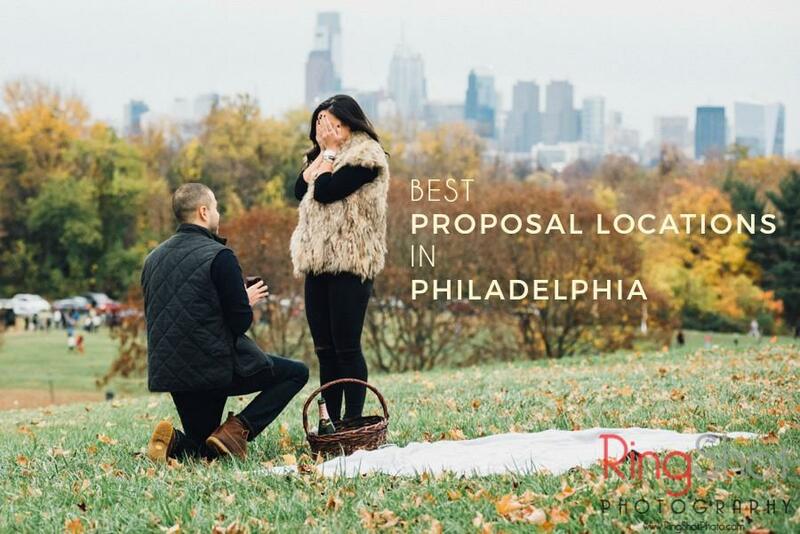 It was important to us that we support as many local Philadelphia vendors as possible. 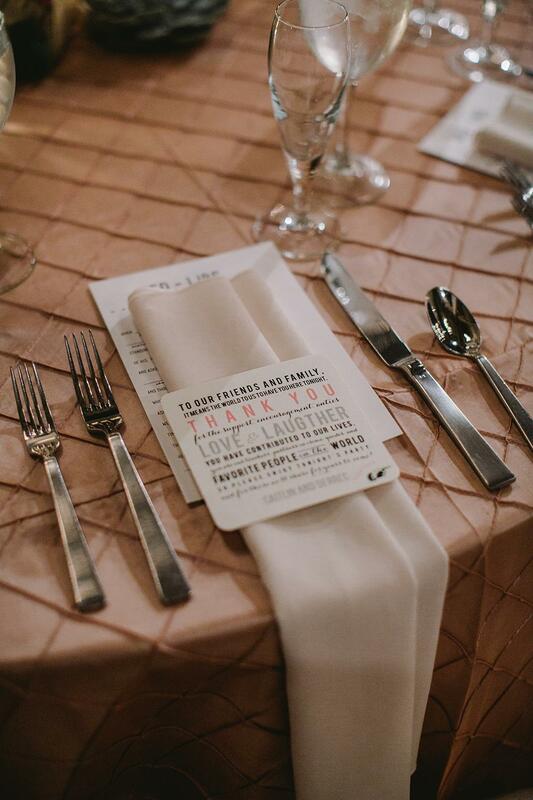 We chose to do our entire invitation suite and all of our paper goods with the super creative Cecilia of Casa Papel. 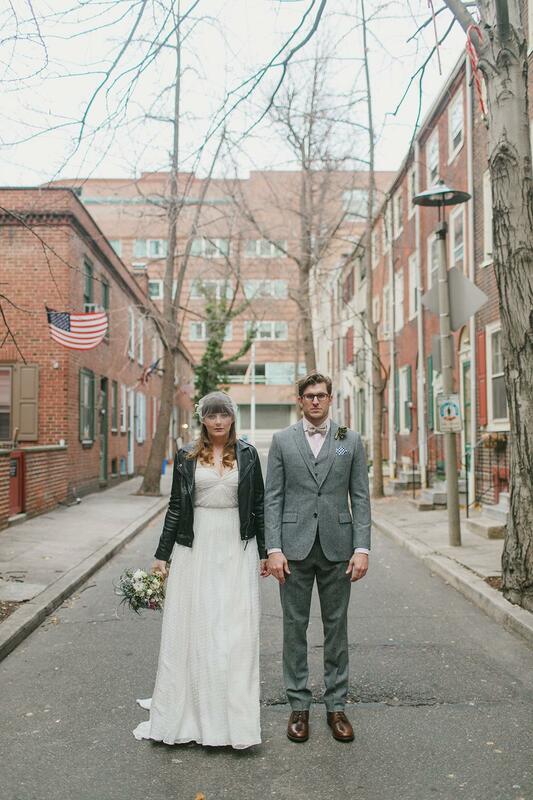 Cecilia is the owner of the adorable shop in Northern Liberties. 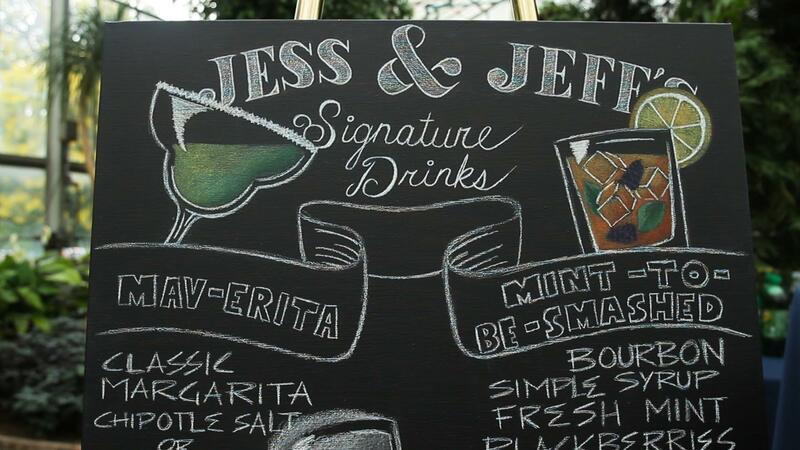 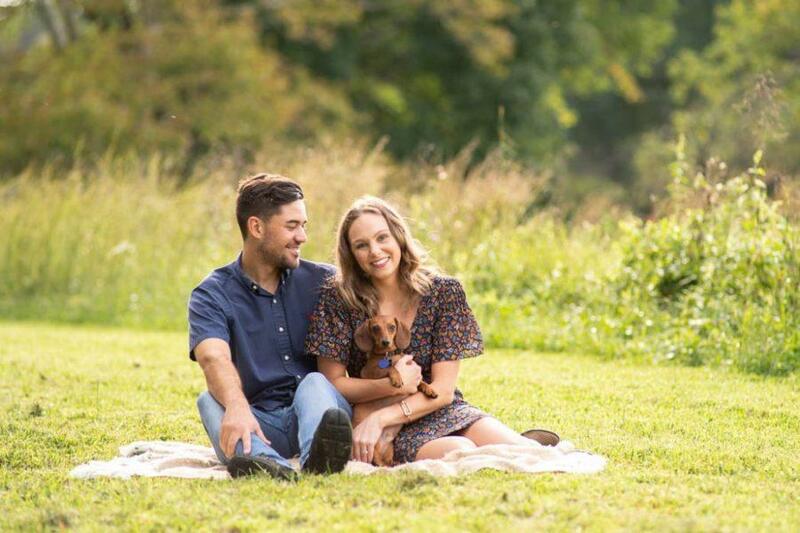 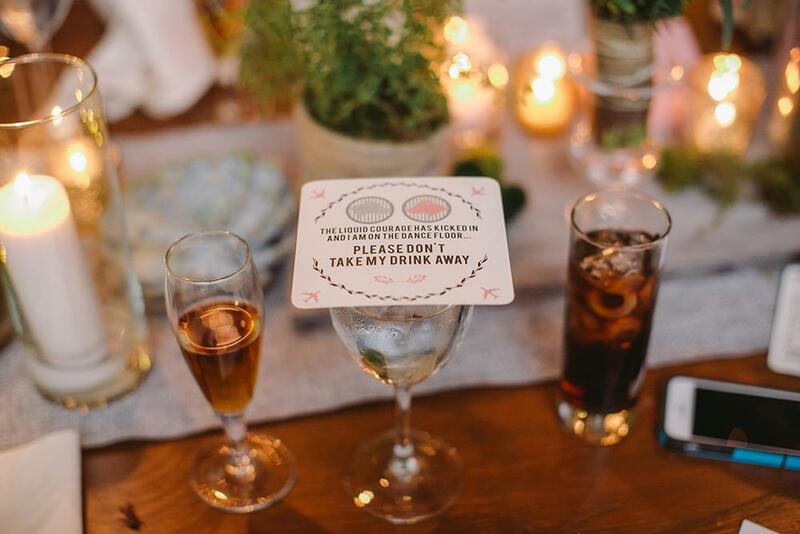 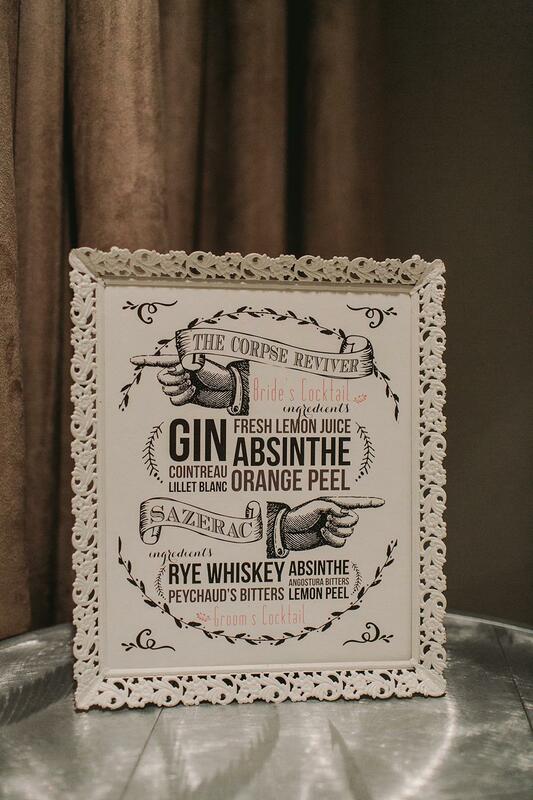 She worked directly with us from start to finish beginning with save the dates all the way through to our day of wedding goods, including signature drink menu’s and gift table sign. 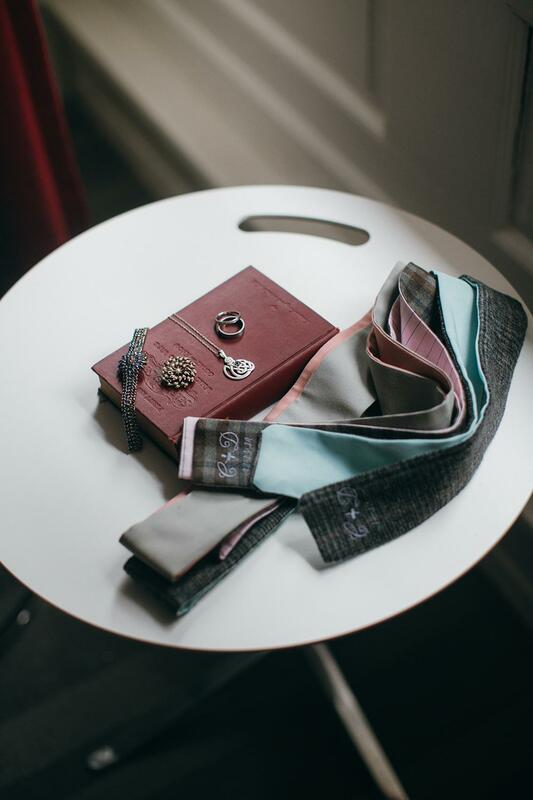 She really listened to our ideas and with her vast knowledge she was able to come up with some incredible never-before-seen styles that represented us completely. 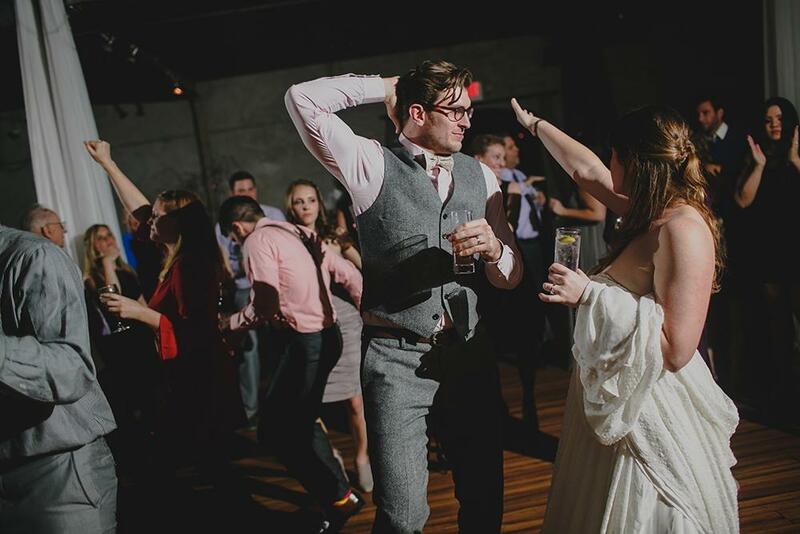 Our wedding was DJ’d by the incomparable and crazy cool DJ Lovesick. 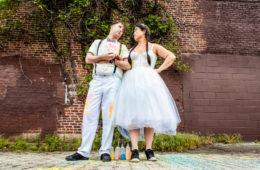 What appealed to us about Lovesick was that first and foremost they are a music lovers DJ. 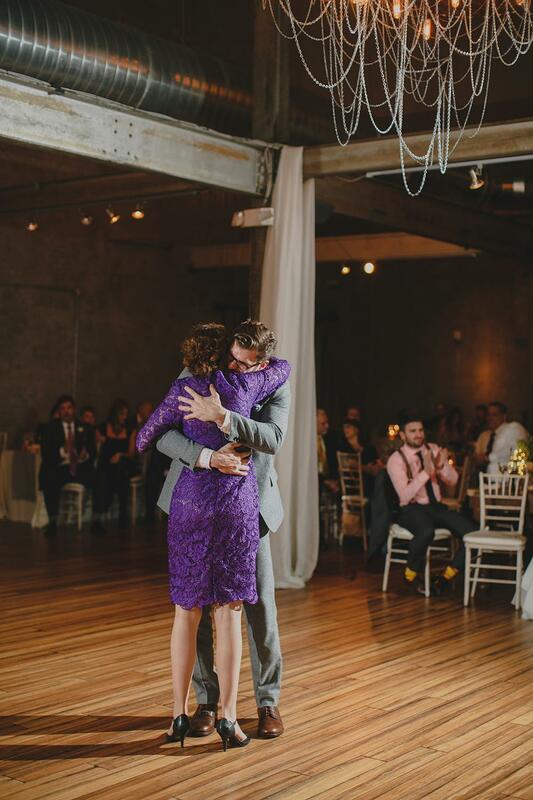 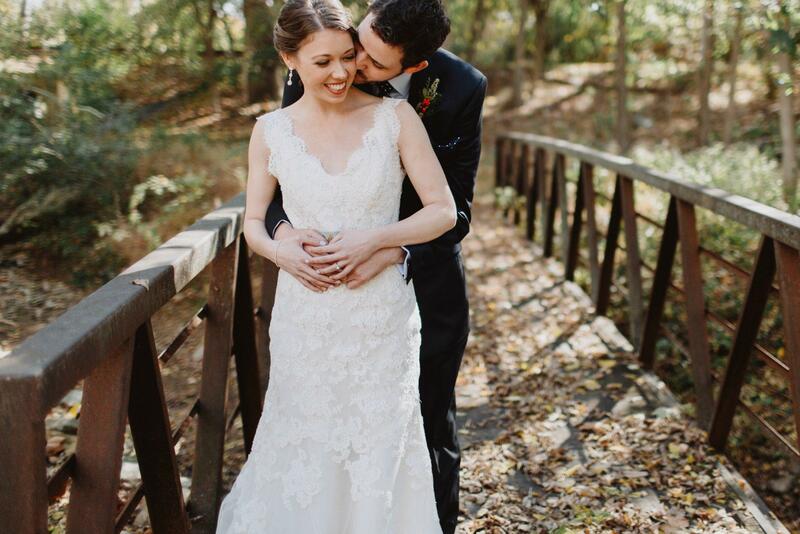 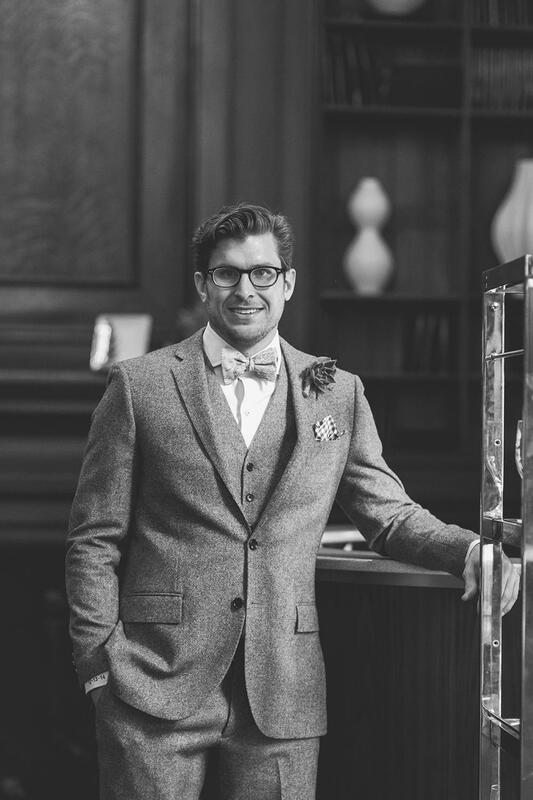 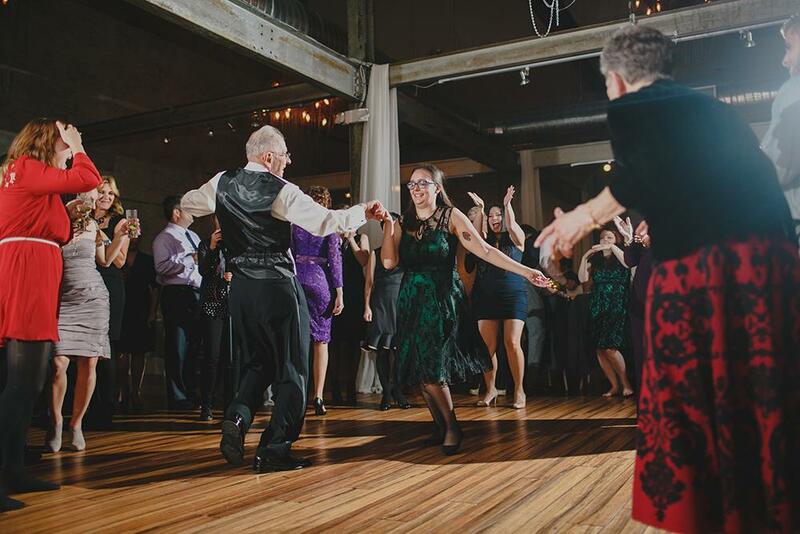 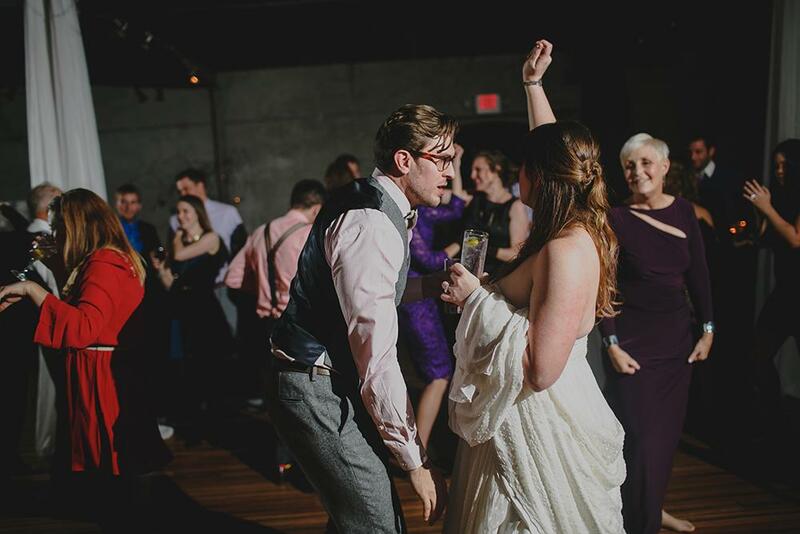 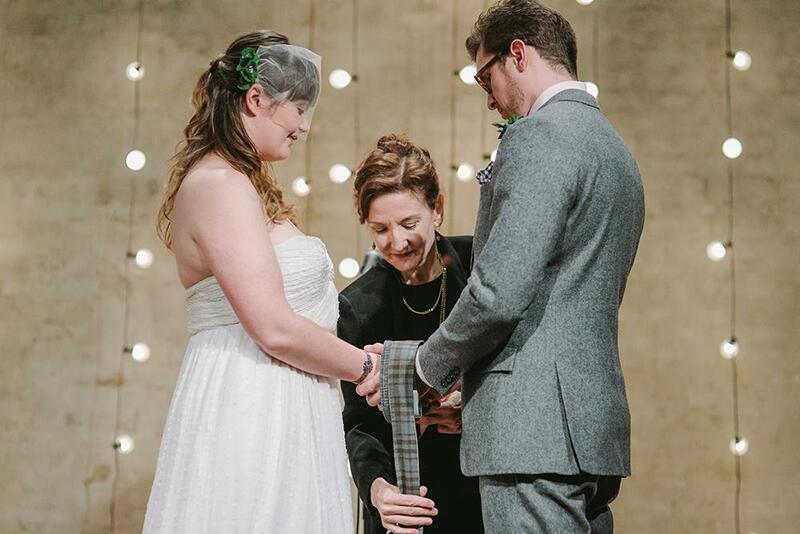 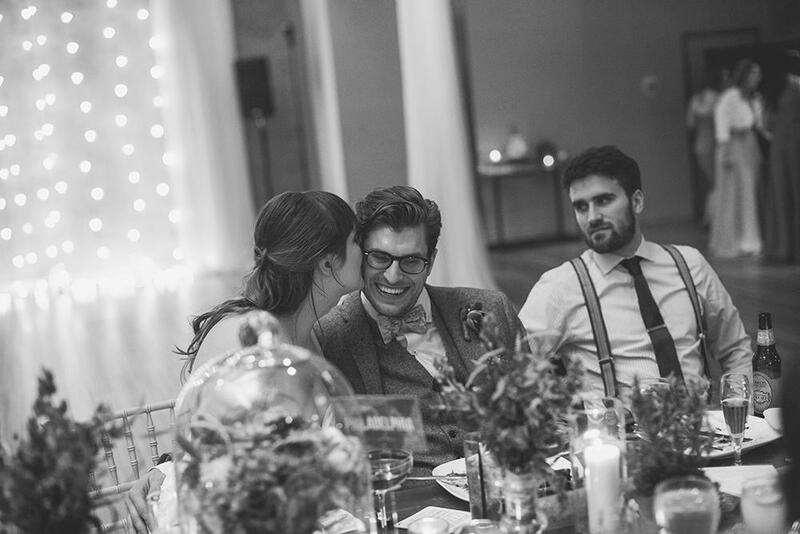 While we are sure upon demand that they would play all of the typical wedding standards, their expertise lies in their ability to build a tailor-made playlist pulling from their comprehensive knowledge of great music, and their mixing was incredible. 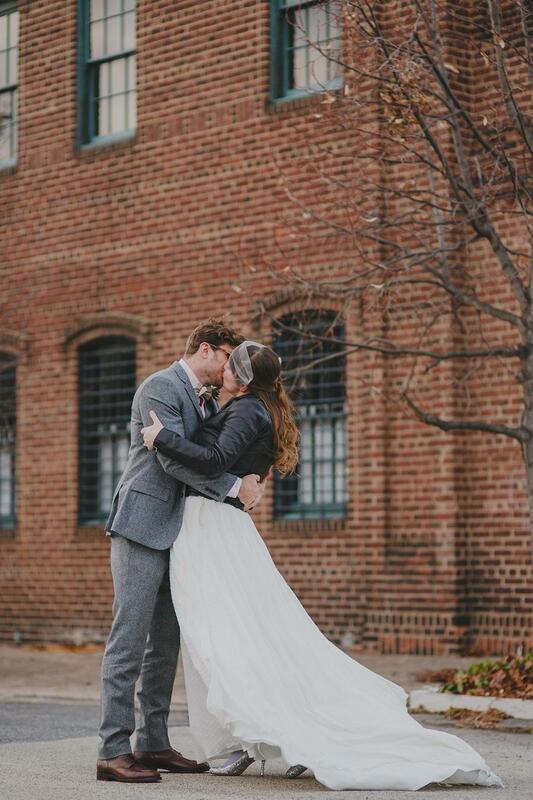 I found my wedding dress at Lovely Bride in Old City. 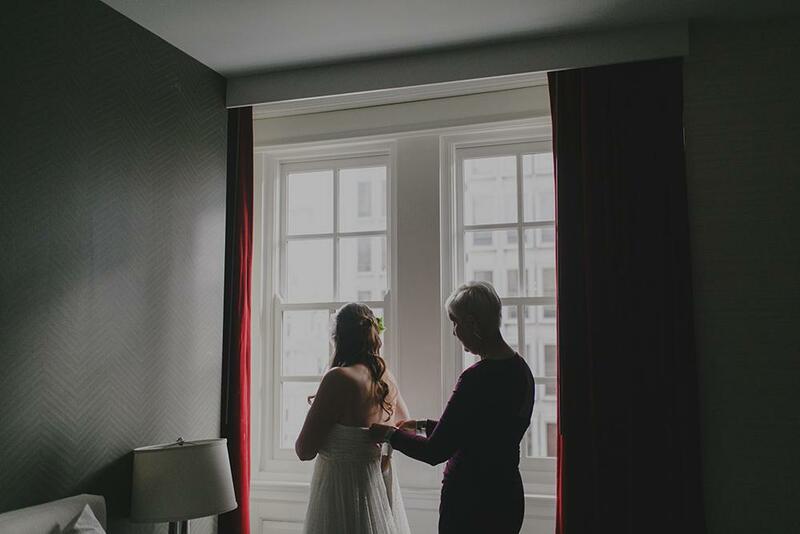 My hair and makeup, along with my bridesmaids, both mothers and my grandmother, were done by the wonderful True Beauty Marks. 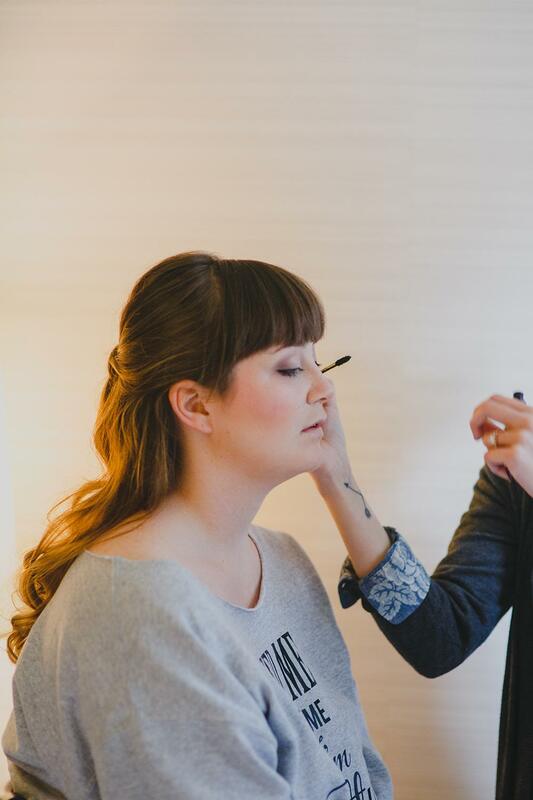 Gina, the owner and key makeup artist, was such a joy to work with. 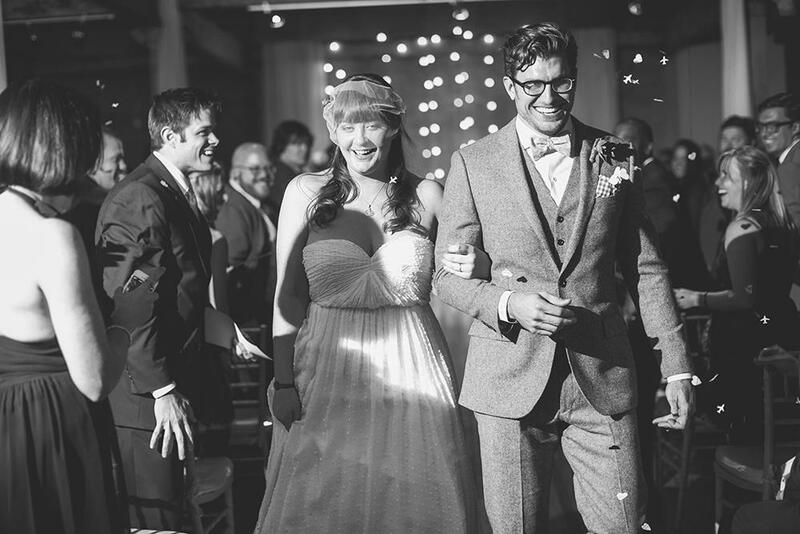 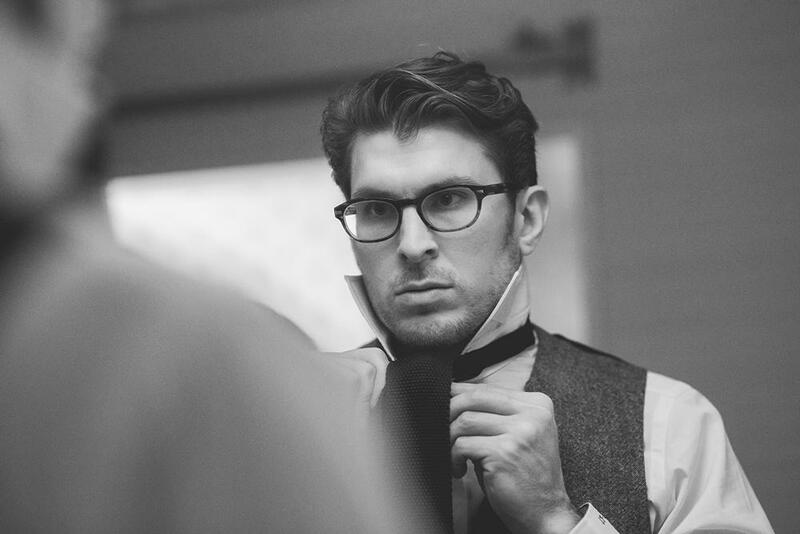 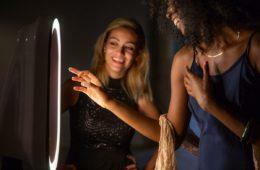 Their approach is all about making you feel genuine, gorgeous and confident. 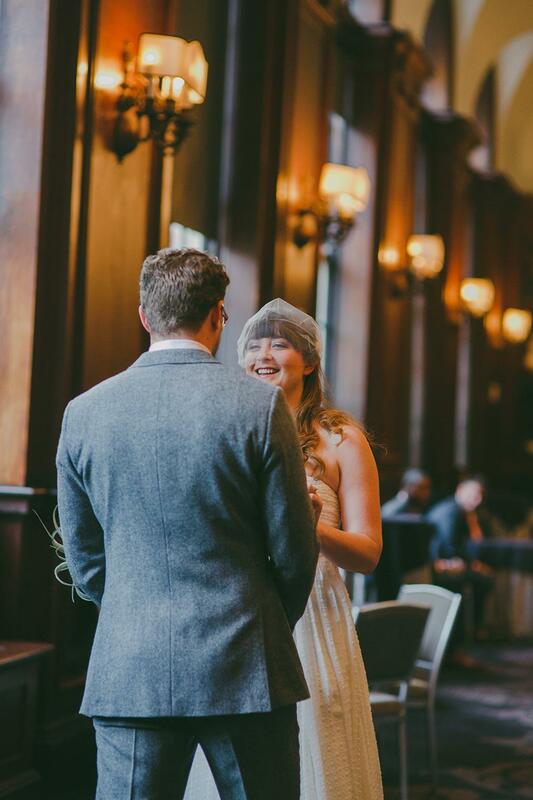 All of these vendors were incredibly professional, organized and understood our vision and were excited to help us see them through. 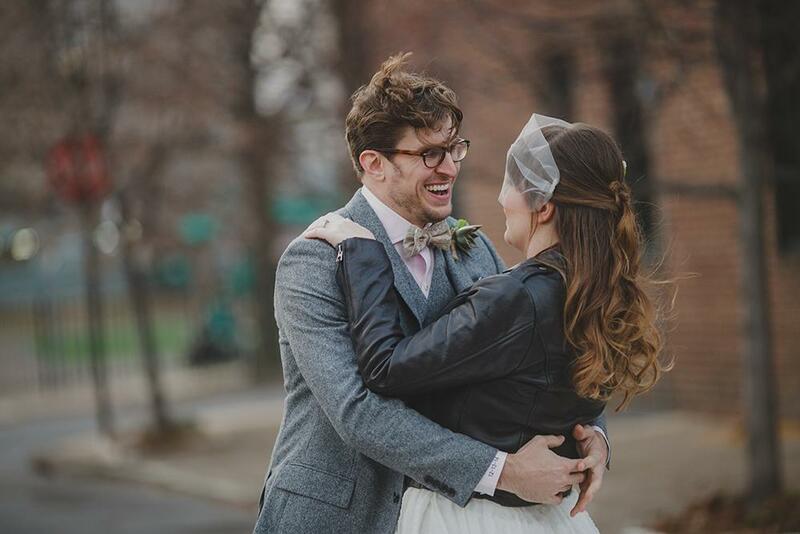 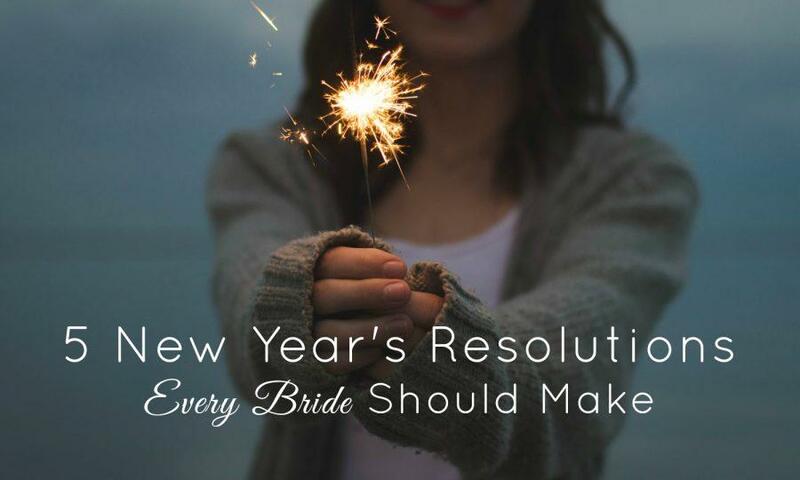 Our only advice for both bride and groom is to have fun, and to remember that the day is about the two of you and celebrating a monumental moment in your lives.